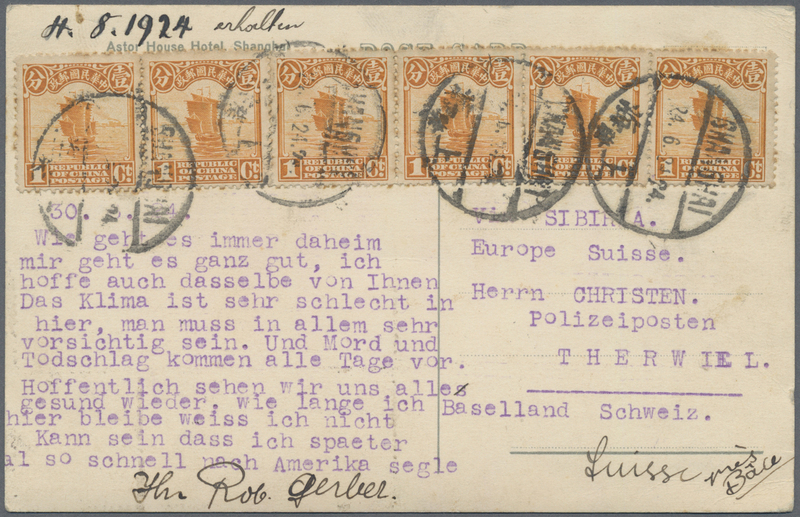 6027 postfrisch (never hinged) ** gestempelt (marked) 173/77, 223/27 1921/29, air mail issue first and revised design, each mint never hinged and used sets. 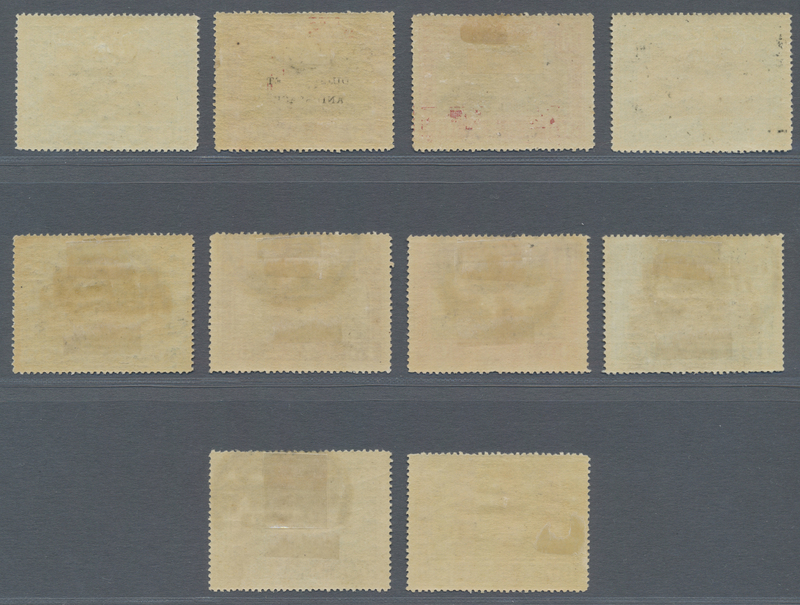 The revised design mint 15 C., 45 C., 60 C. and 90 C. with top imprint margins, extra mm copies of the 15 and 30 C. (Michel cat. 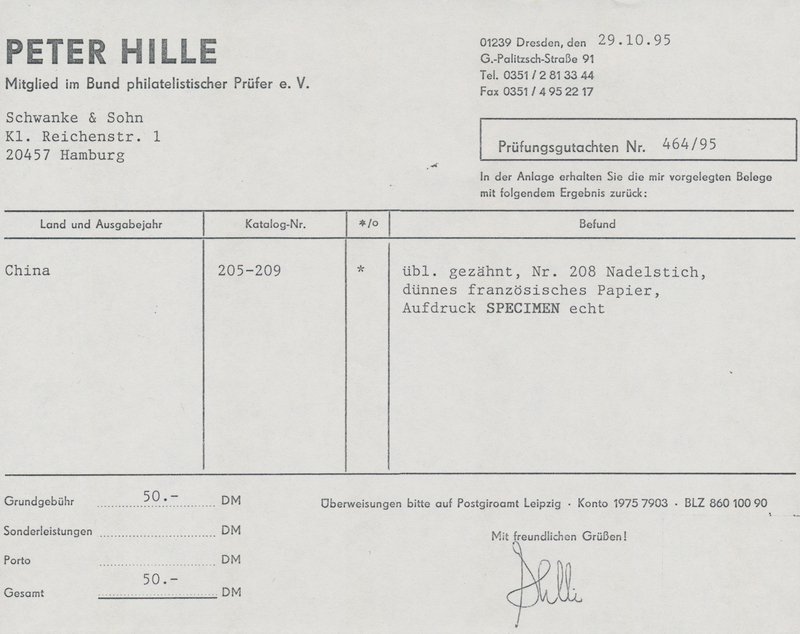 410+). 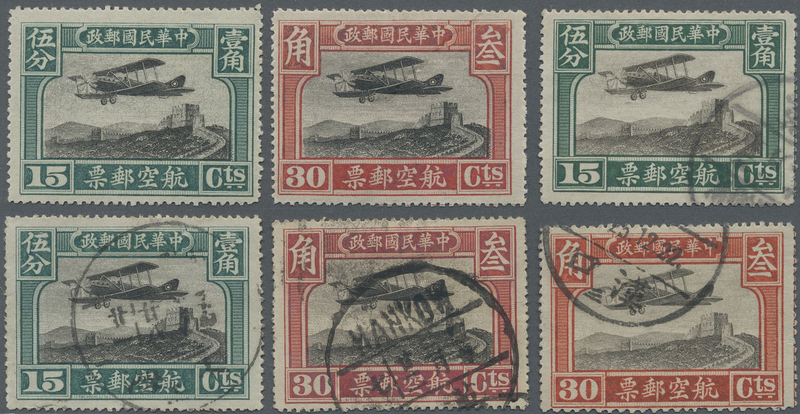 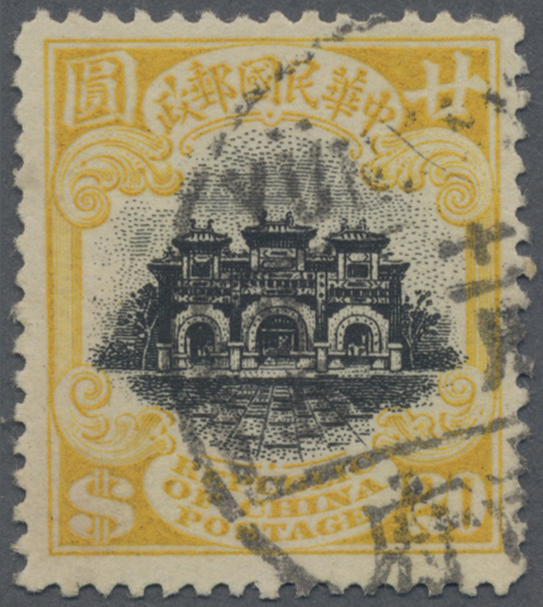 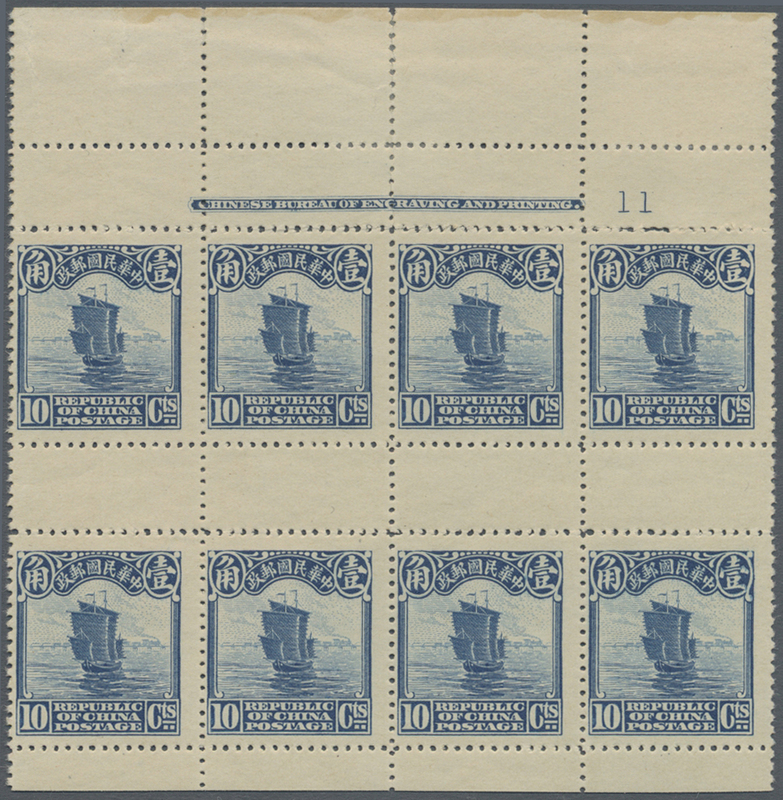 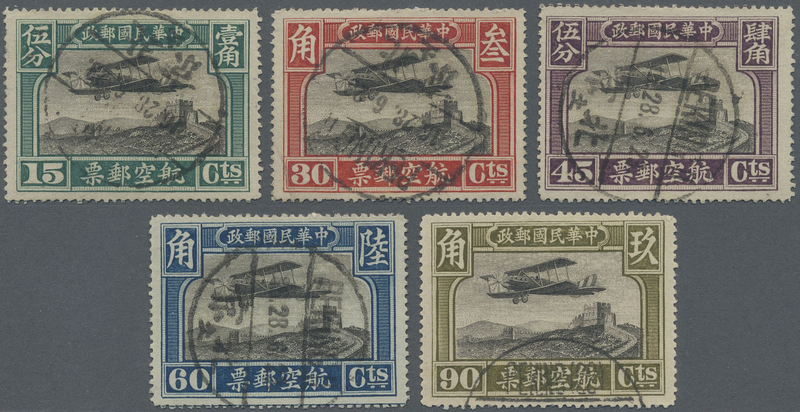 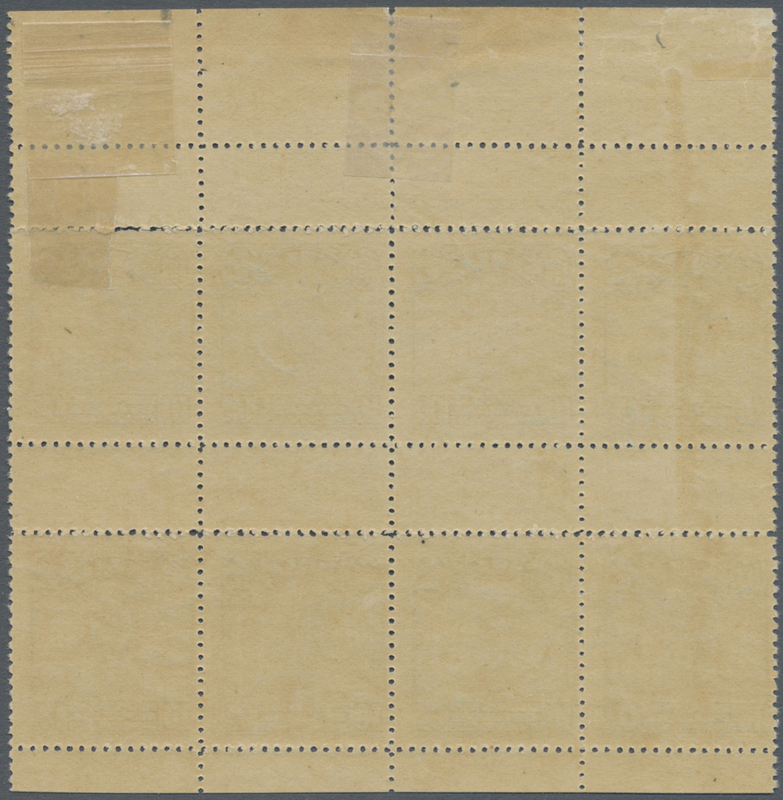 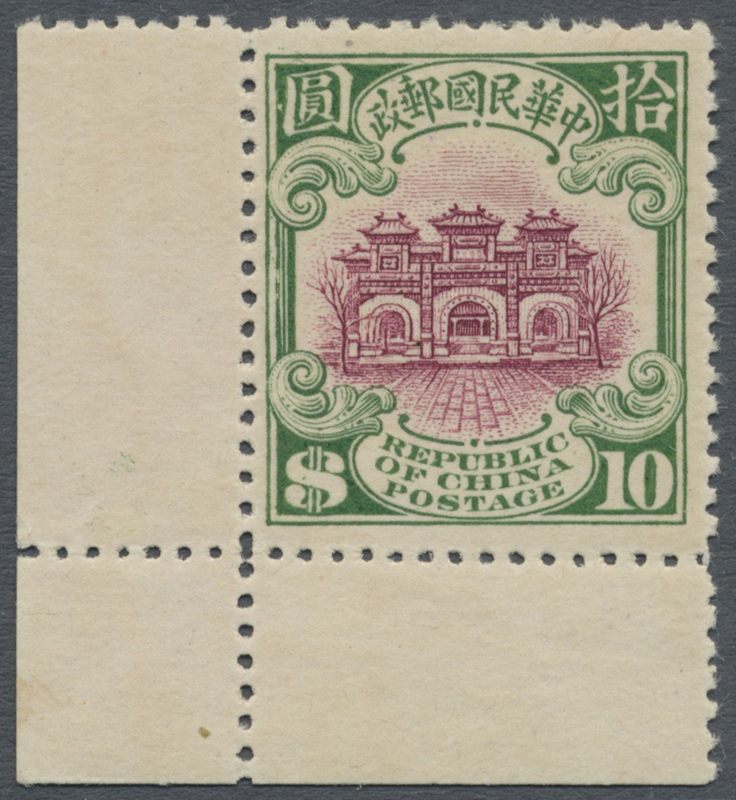 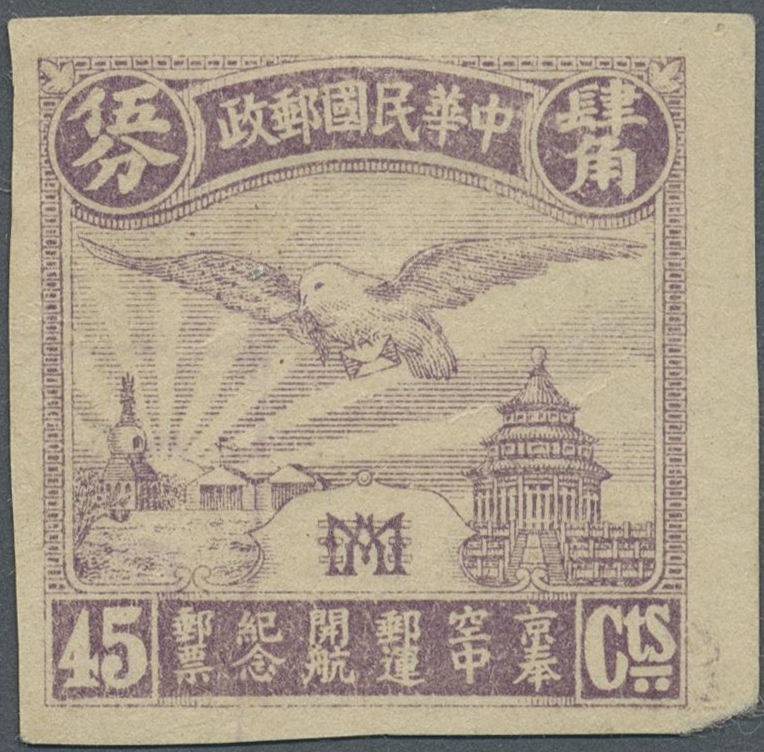 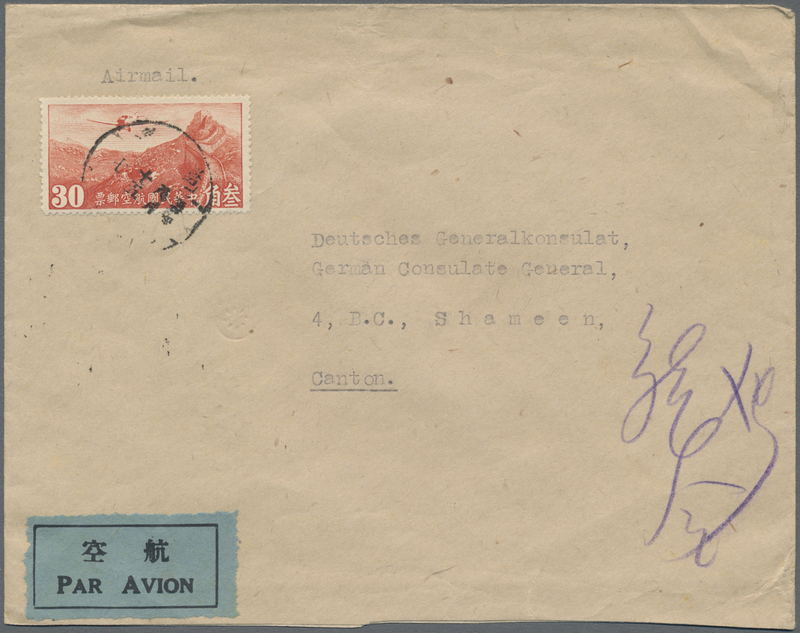 6029 1921, unissued, "Peking-Fengtien Air Mail Commemoratives", 45 C., imperforated proof on ungummed paper, a right margin copy, tiny thin on reverse (Chan AP52 pr.). 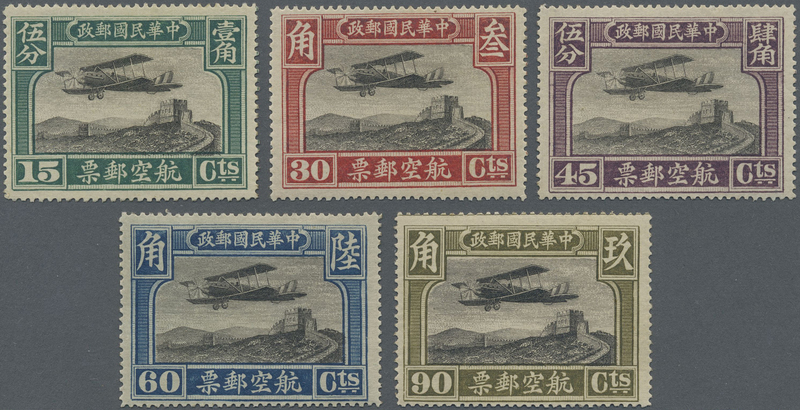 6030 schön (beautifully)postfrisch (never hinged) **ErsttagsblätterAnsichtskarte (Picture postcard) 1921, unissued, "Peking-Fengtien Air Mail Commemoratives" set, 15 C./45 C., each with boxed part hs. 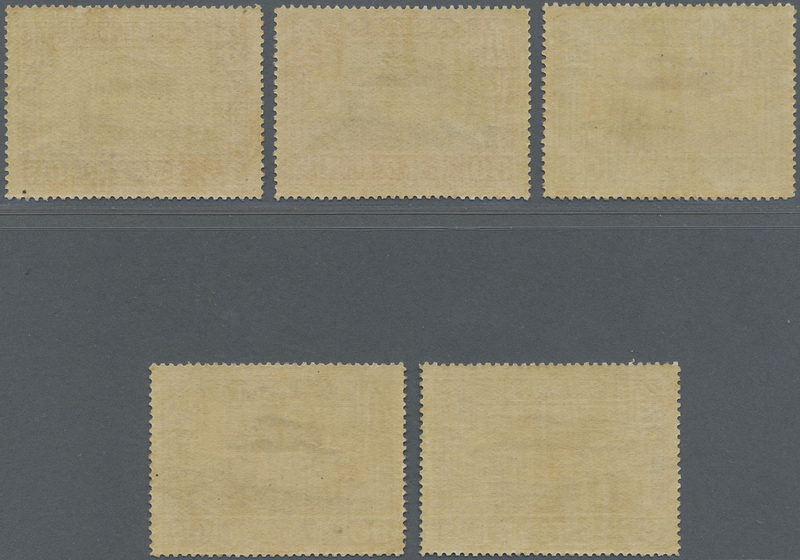 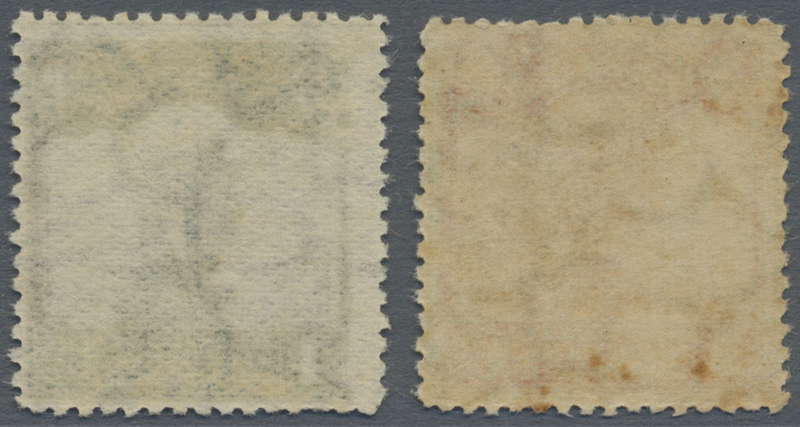 "SPECIMEN", unused mounted mint, the 15 C. tiny thin and the 45 C. strong crease. 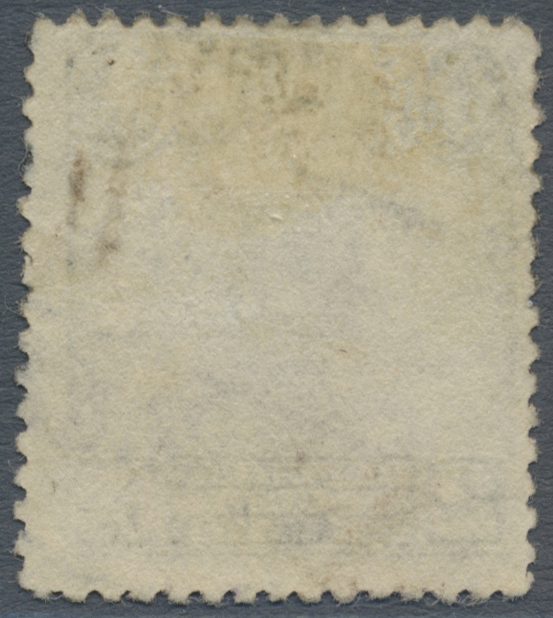 (Chan AP50/52; $1000). 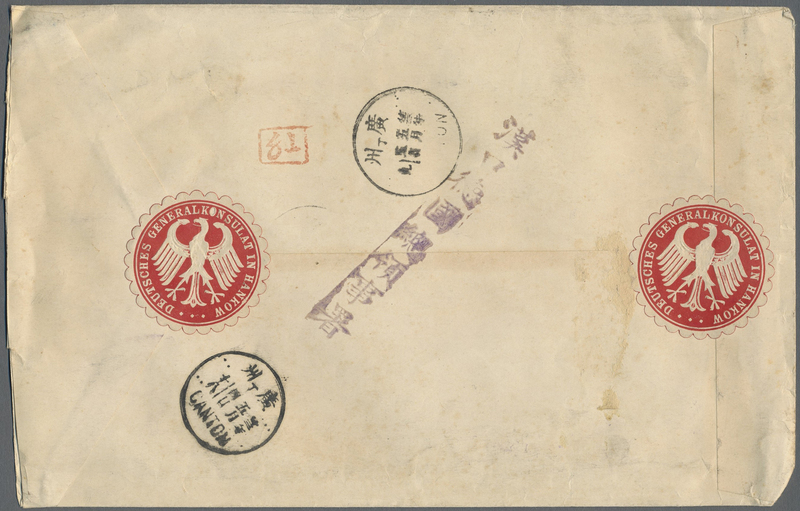 6031 ungebraucht (hinged) * 187U (2 1923, 2nd Peking printing, junk 1/2 C. horiz. 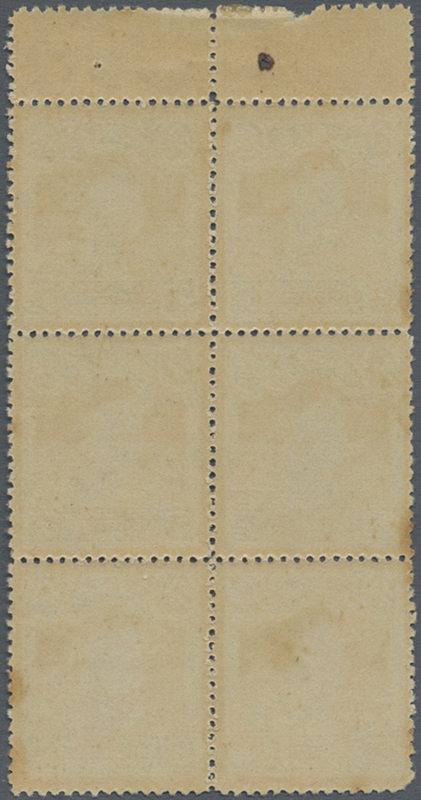 pair imperf. 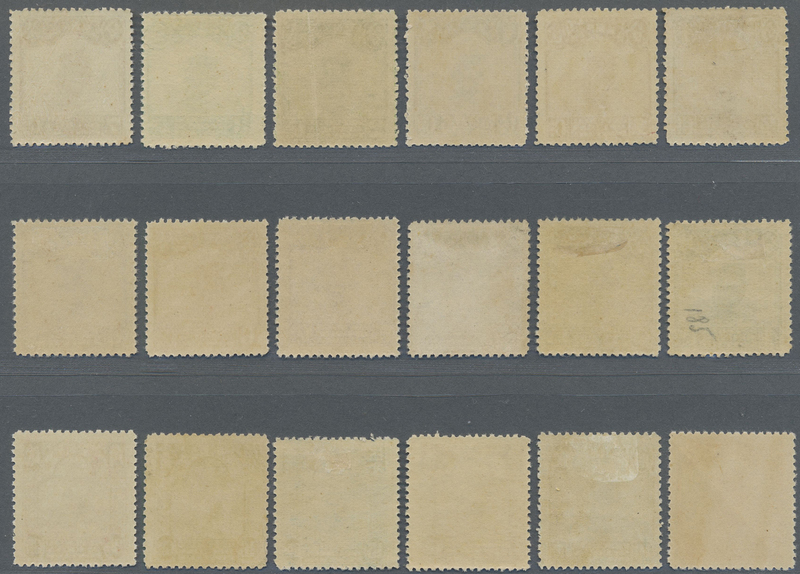 in-between, unused mounted mint. 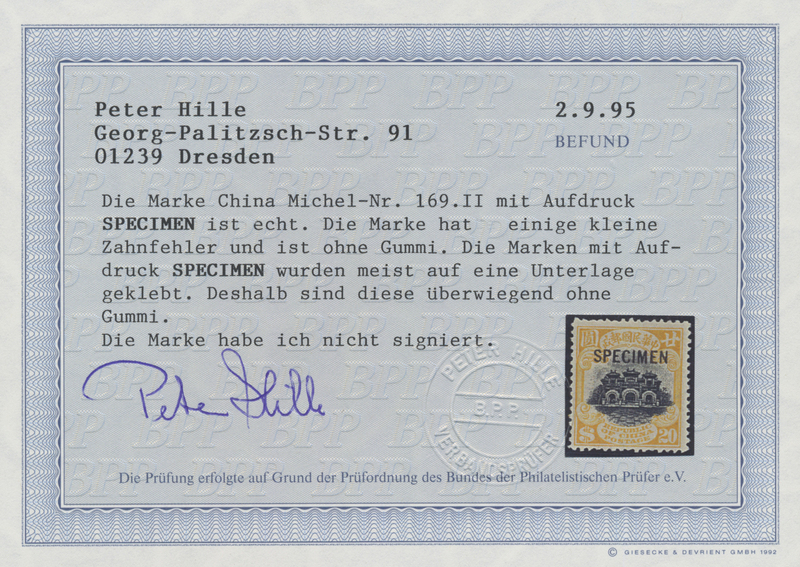 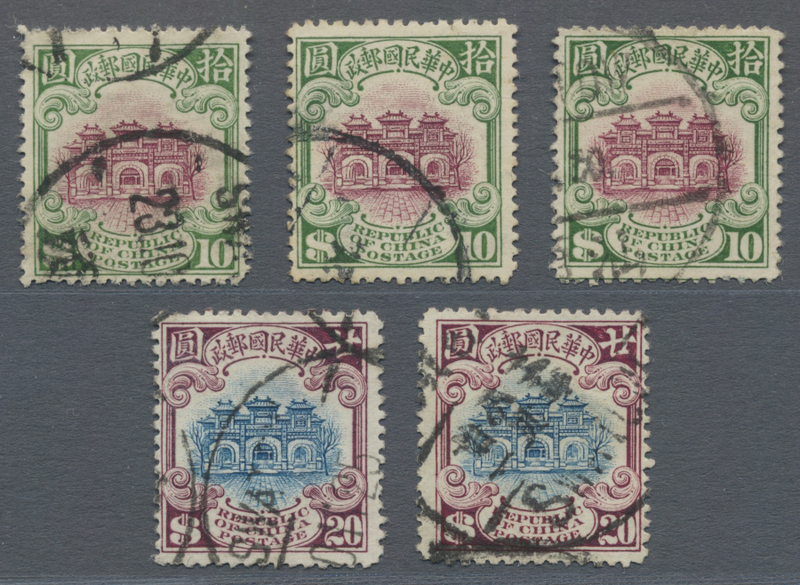 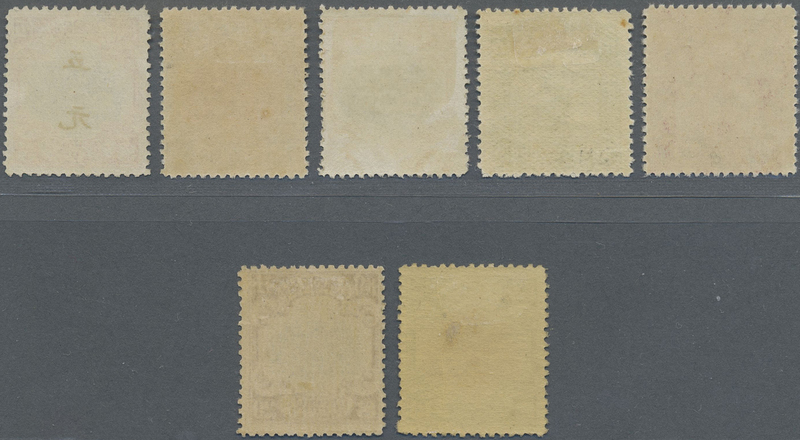 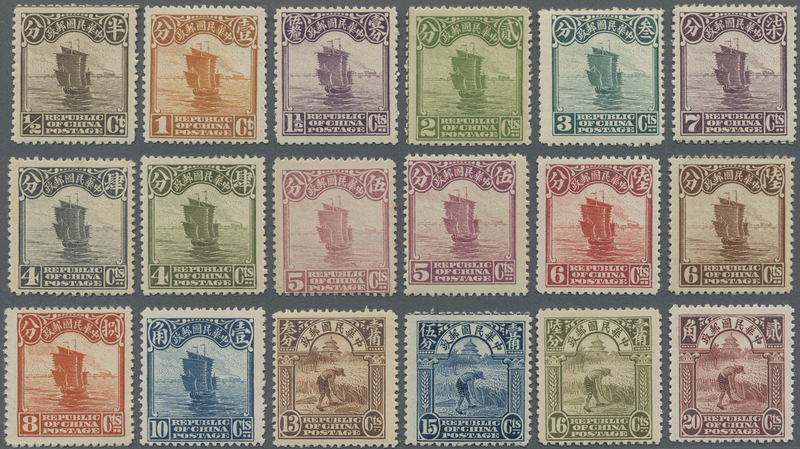 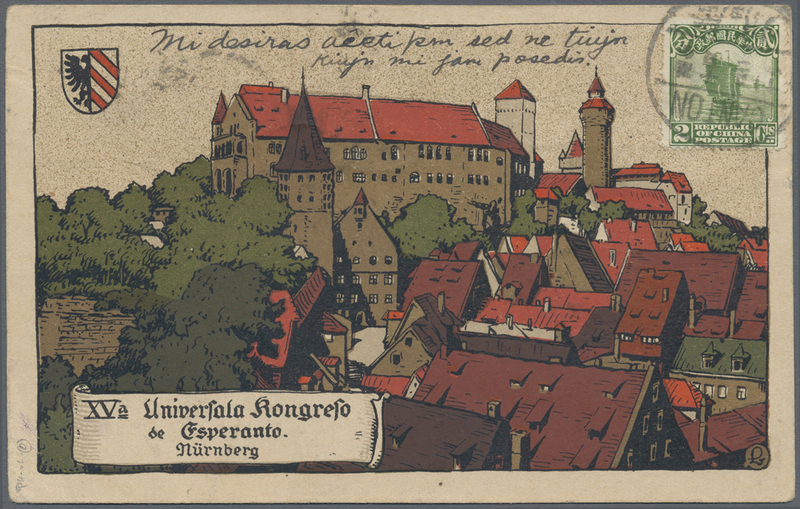 6032 ungebraucht (hinged) * 187/209, 278 1923/33, junk/reaper/hall, 2nd Peking printing, unused mounted mint, mostly first mount LH, the 4-5-20 C. exra copies (shades), $10 slight gum crease (Michel cat. 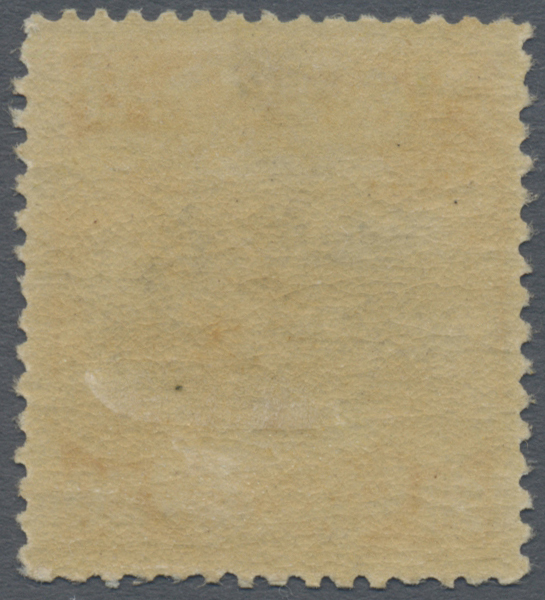 2524.-). 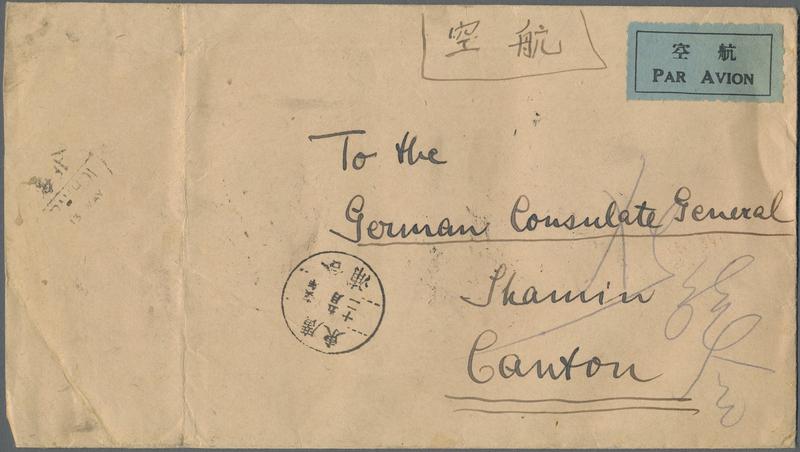 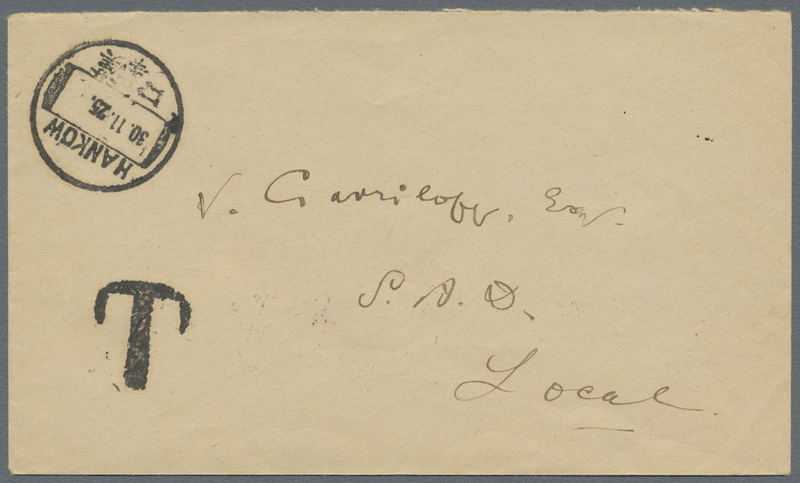 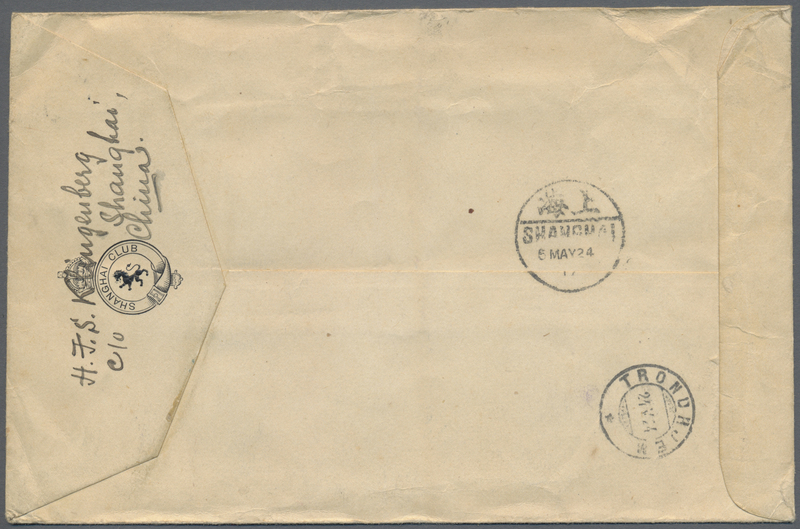 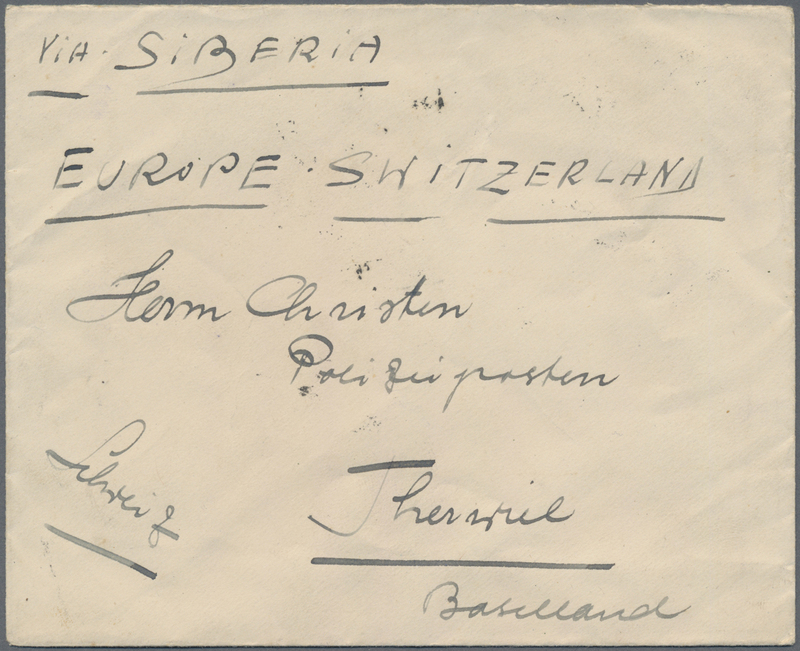 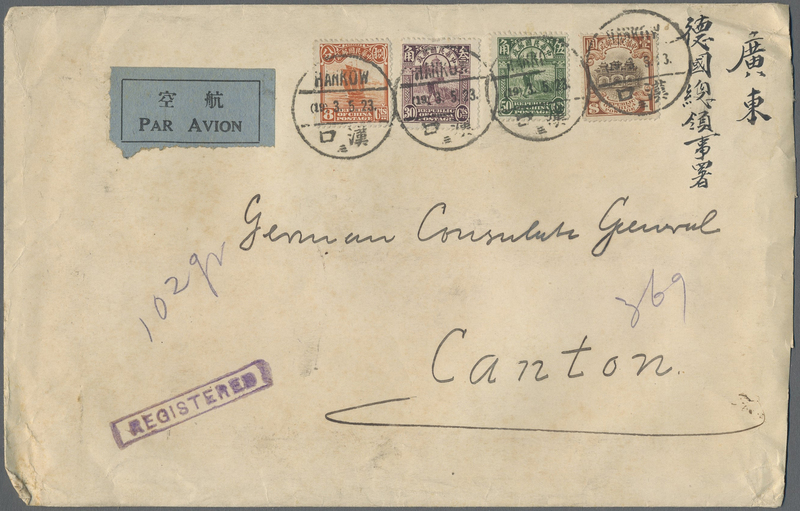 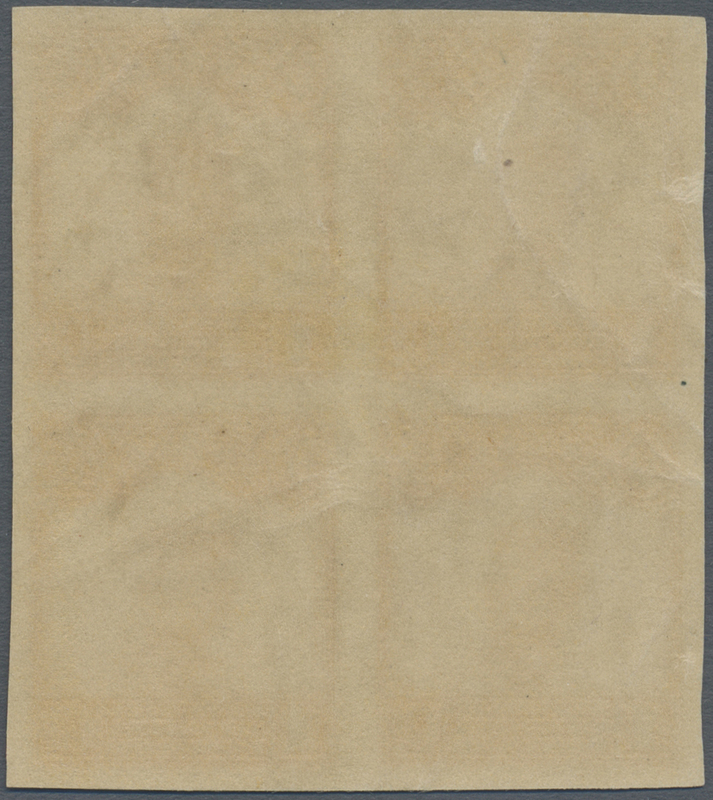 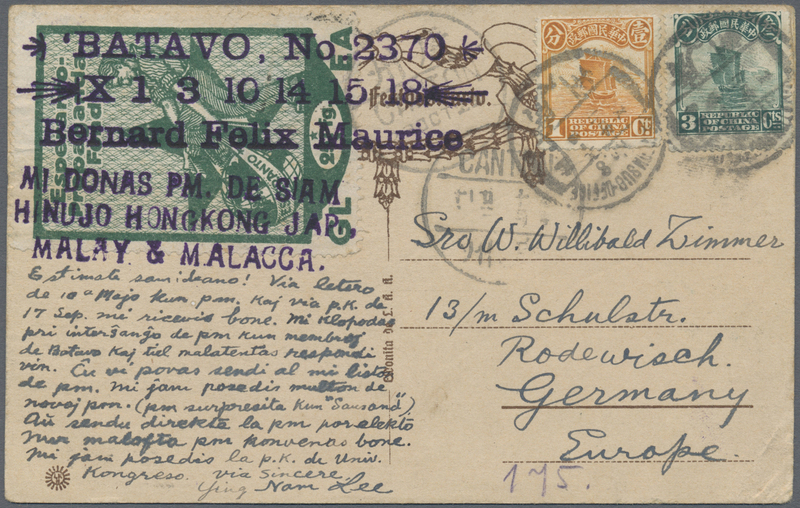 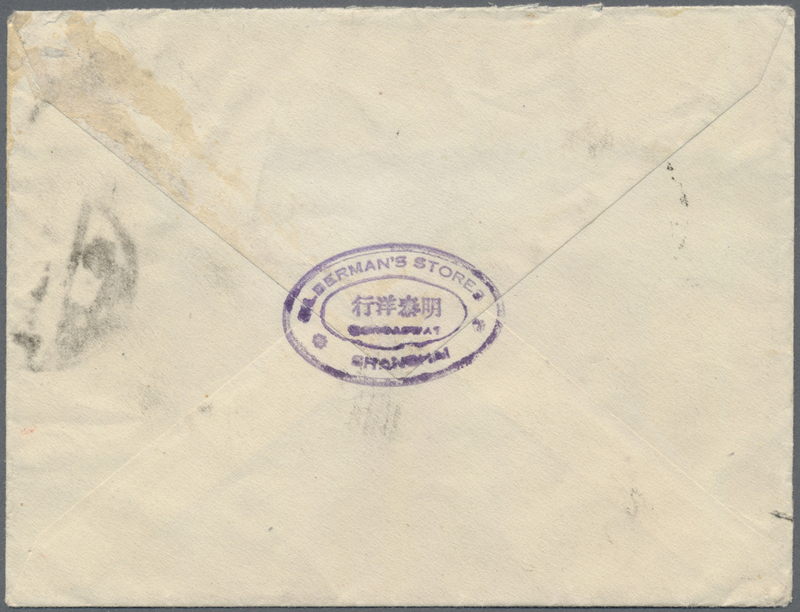 6033 Brief (cover) 187, 189 1923, junks 1/2 C., 1 1/2 C. on local letter of Hankow with used as postage due tied by boxed postmark "canceled" as subsequent cancellation. 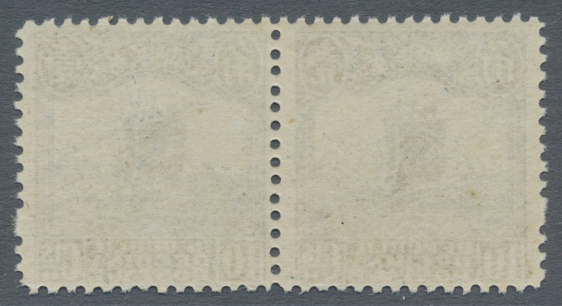 6034 postfrisch (never hinged) ** 188 var. 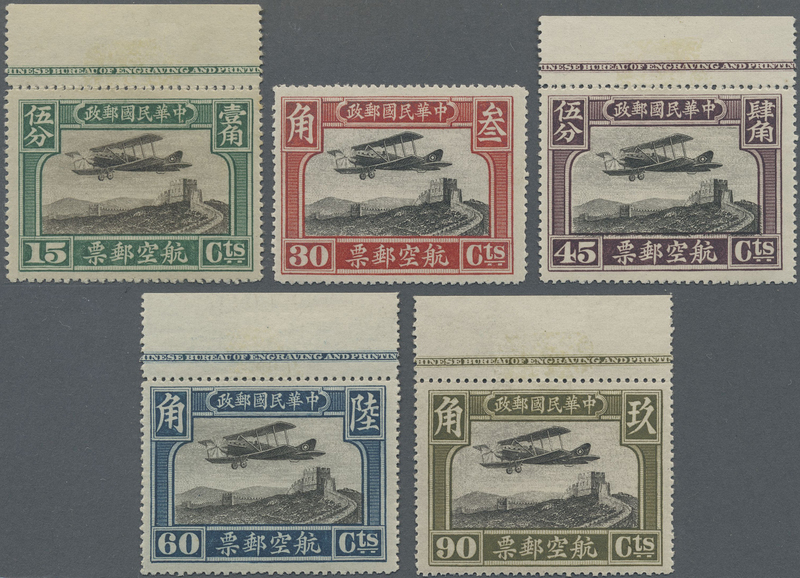 1923, 2nd Peking printing, junk 1 C. booklet pane of 6, mint never hinged MNH. 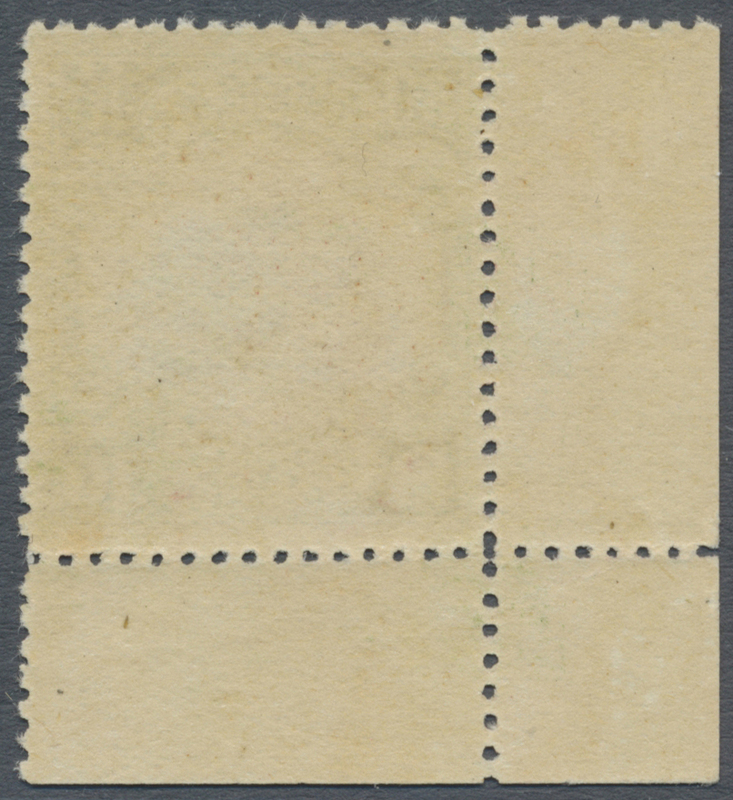 6035 postfrisch (never hinged) ** 188 var. 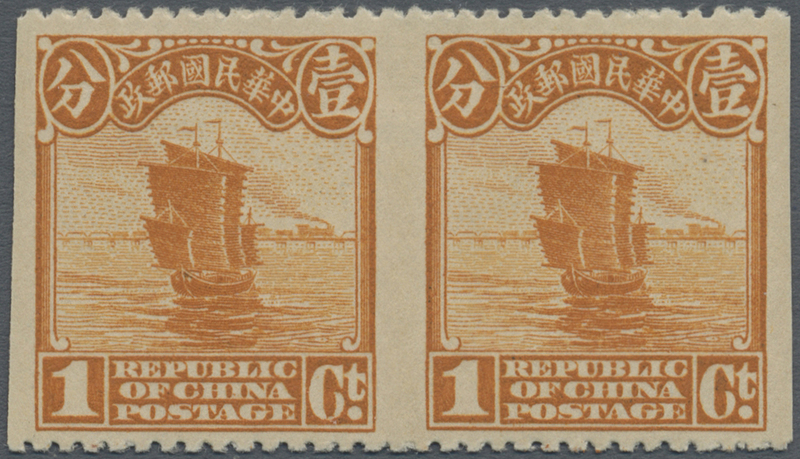 1923, 2nd Peking printing, junk 1 C. prepared but not used in booklet, pane of 4, mint never hinged MNH. 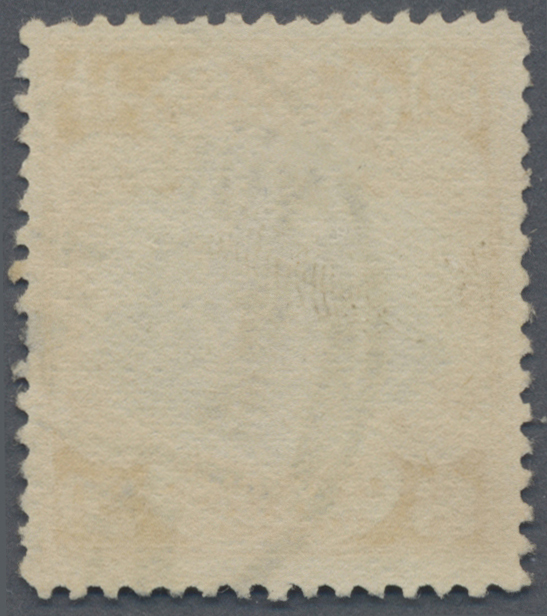 6036 postfrisch (never hinged) ** 188 var. 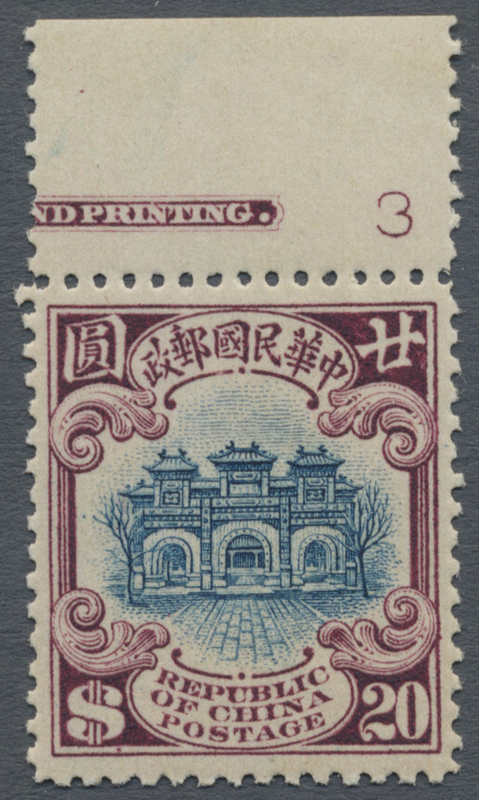 1923, 2nd Peking printing, 1 C. prepared but not used in booklet, pane of 6, mint never hinged MNH. 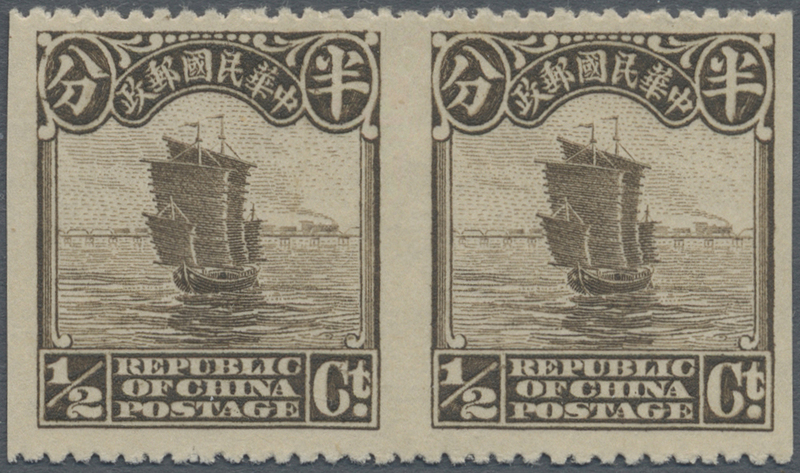 6037 ungebraucht (hinged) * 188U (2) 1923, 2nd Peking printing, 1 C. horiz. 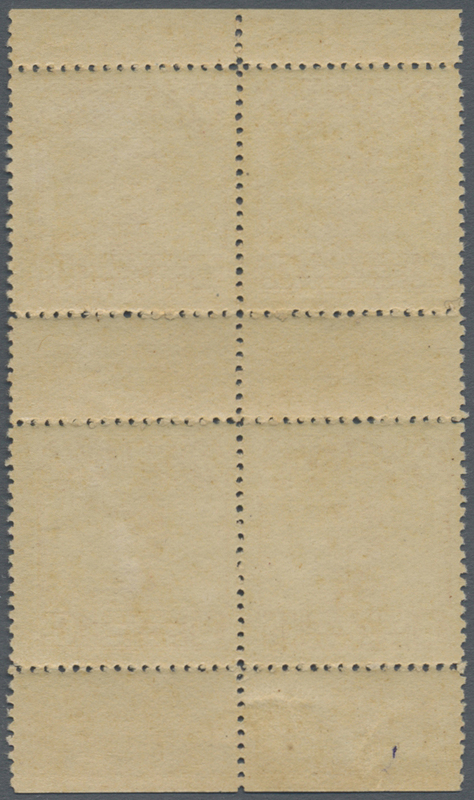 pair imperf. 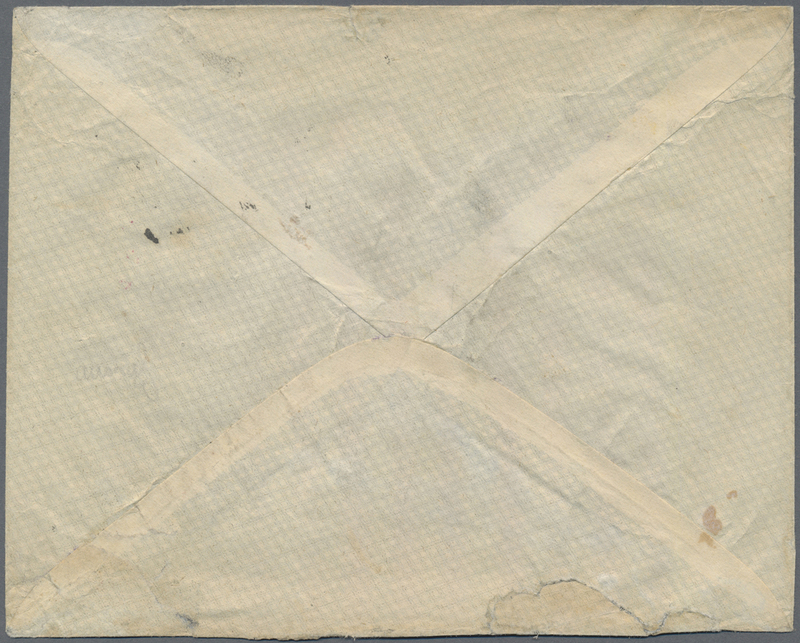 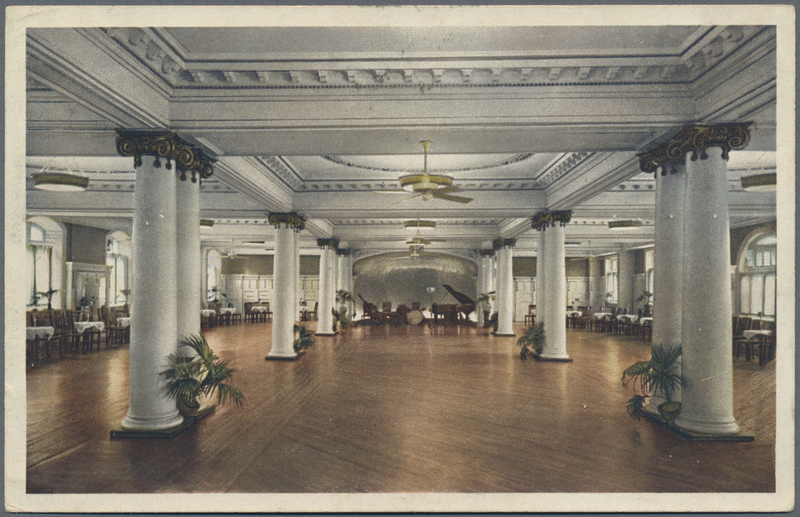 between, unused mounted mint. 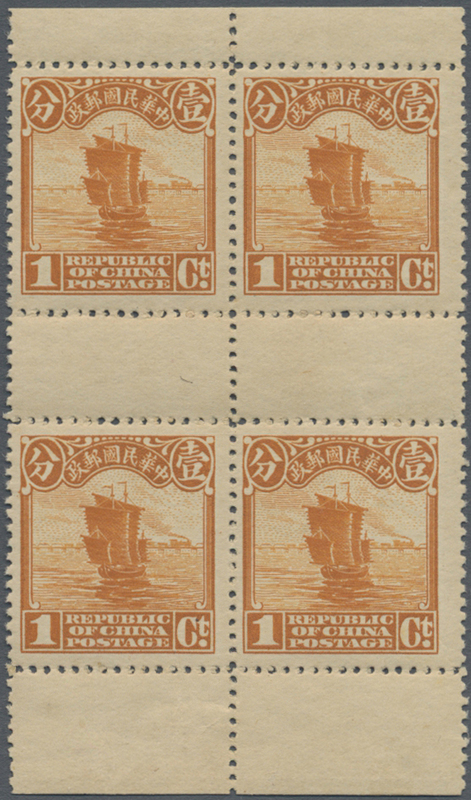 6038 ungebraucht (hinged) * 4er (Block) 188U (4) 1923, 2nd Peking printing, junk 1 C. imperforated block of 4, unused mounted mint., pos. 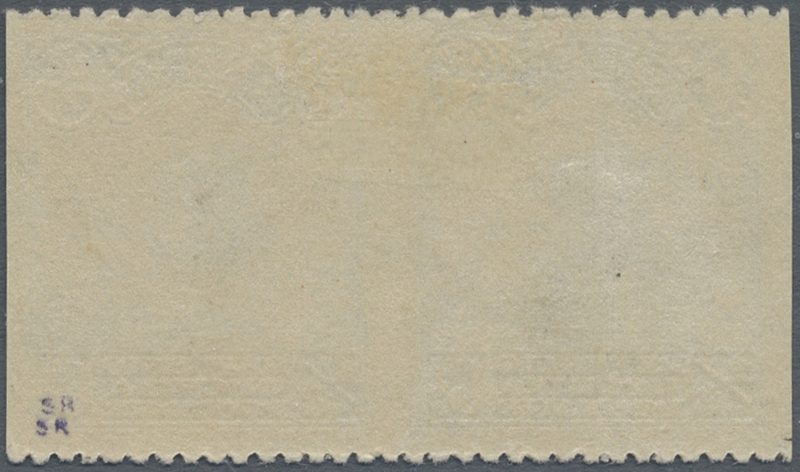 1 crease. 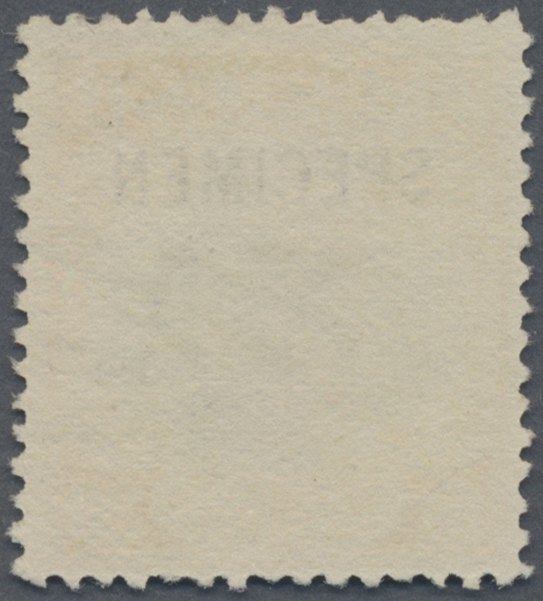 6039 ungebraucht (hinged) * 188, 193 var. 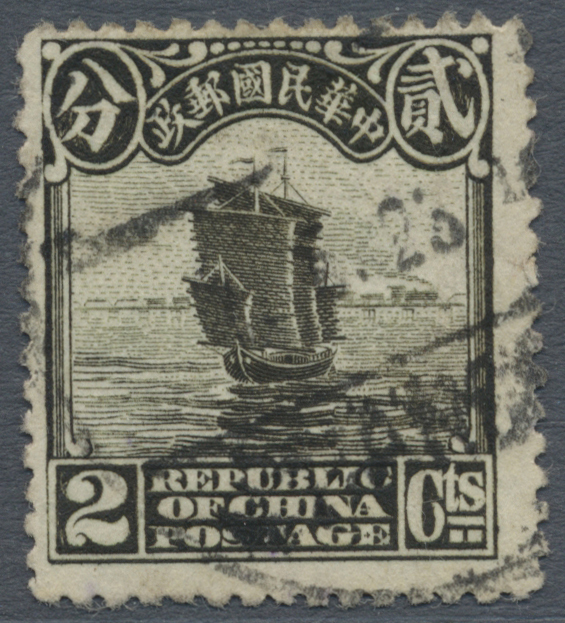 1923/26, 2nd Peking printing, experimental watermark: webbing watermark (Versuchsauflage Wz. 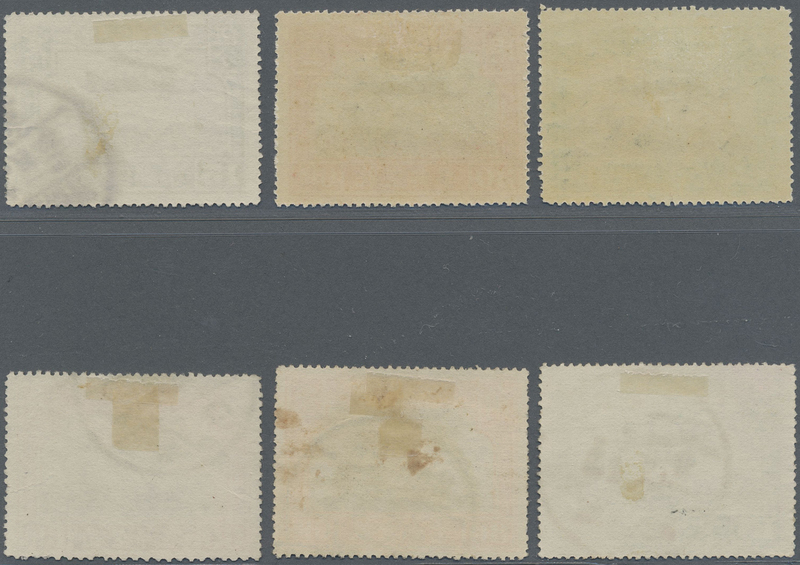 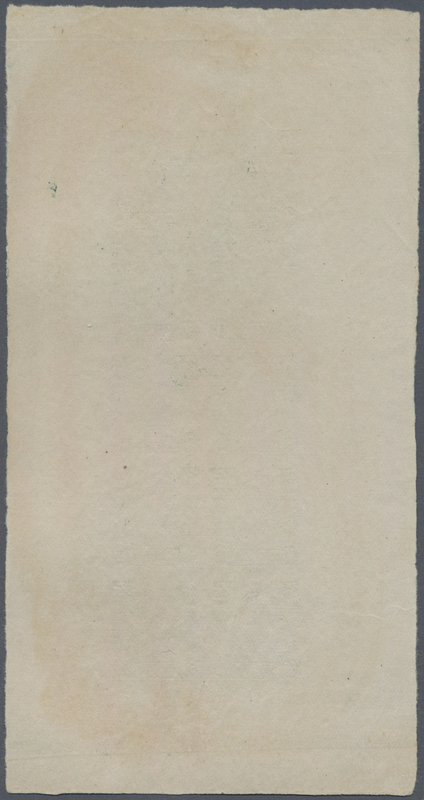 Rauten) from experimental printing, 1 C. mounted mint and 4 C. no gum, the wmk. 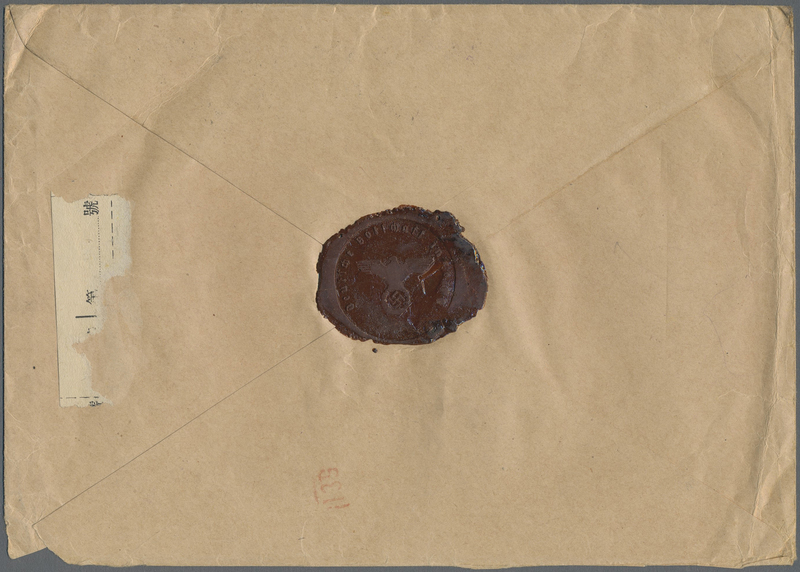 project not realized in postal practice (Chan 250E, 255E; $10.000). 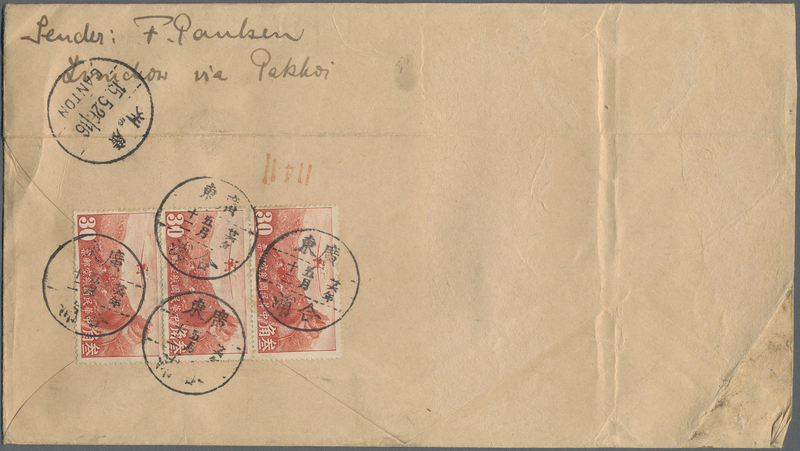 6043 postfrisch (never hinged) ** 191 var. 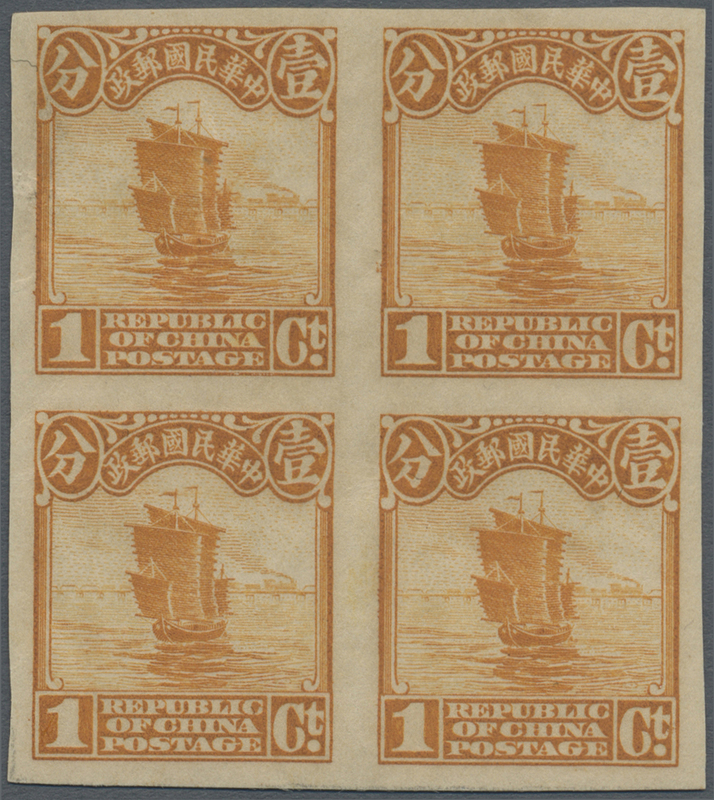 1923, 2nd Peking printing, junk 3 C. booklet pane of 6, mint never hinged MNH, some tonings on reverse. 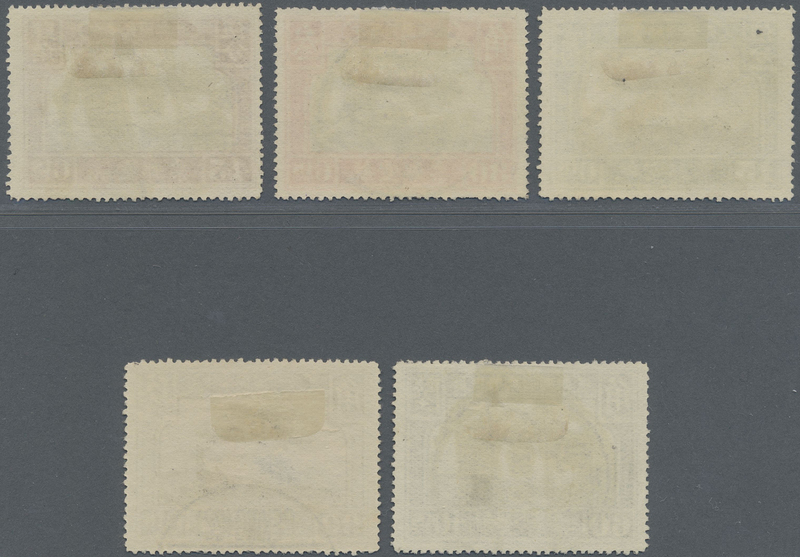 6044 postfrisch (never hinged) ** 191 (6) var. 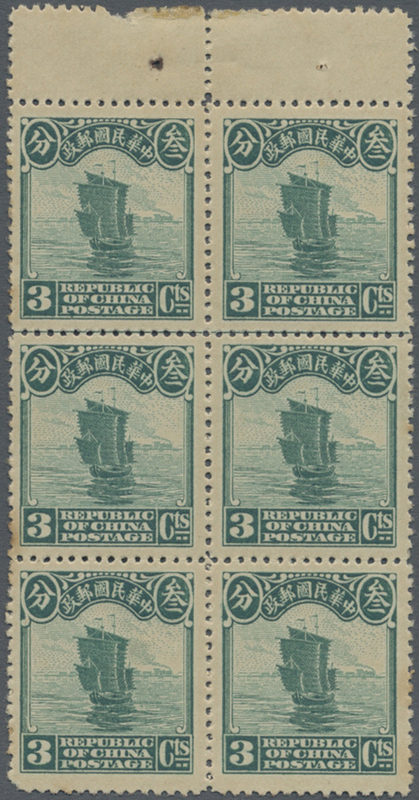 1923, 2nd Peking printing, junk 3 C. examples of panes specially printed for booklet, pane of 6 with lower margins, mint never hinged MNH. 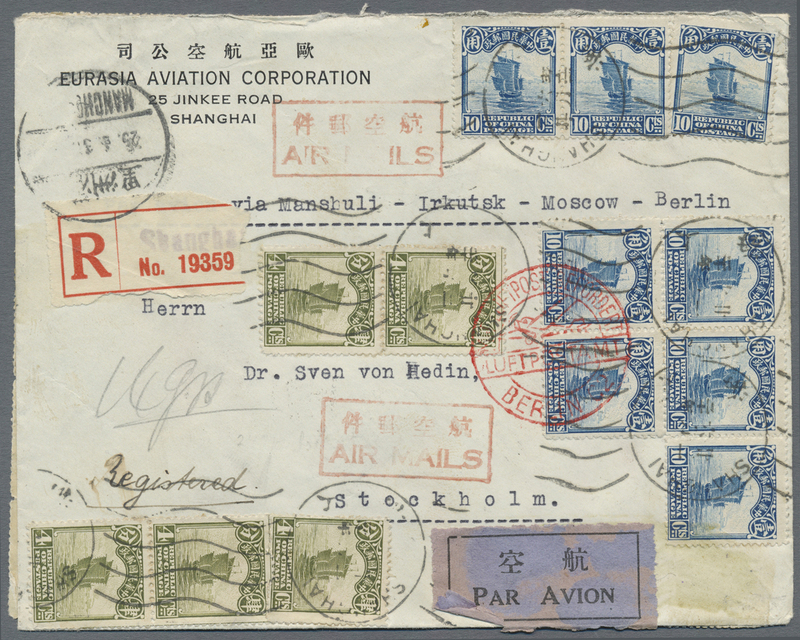 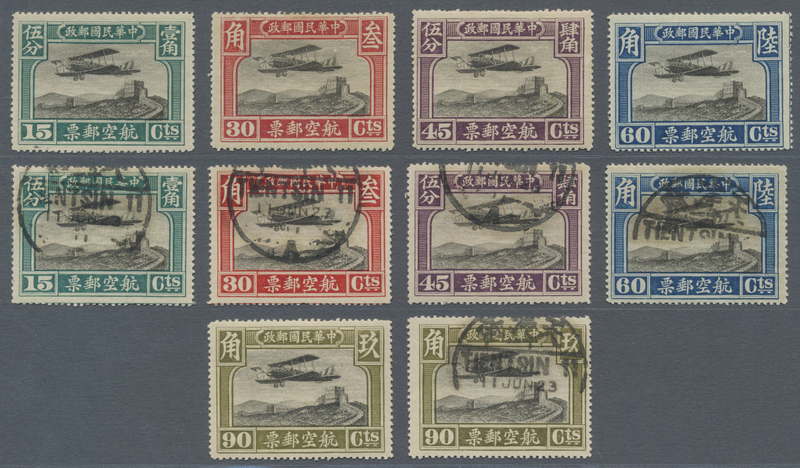 6045 Flugpostbrief (Flight cover) 192 (40), 196 (8) 1923/26, 2nd Peking printing 4 C.(40 inc. block of 35 on reverse), 10 C. (8) tied "SHANGHAI 21.6.2" (June 2, 1931) to registered cover air mail cover via Manchuli, Irkutsk, Moscow and Berlin to Stockholm/Sweden with July 4 arrival, from the Sven Hedin correspondence. 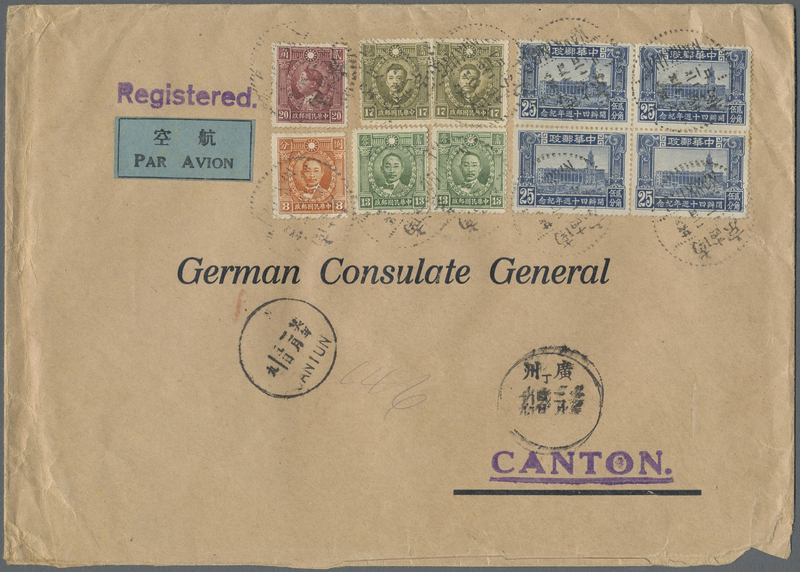 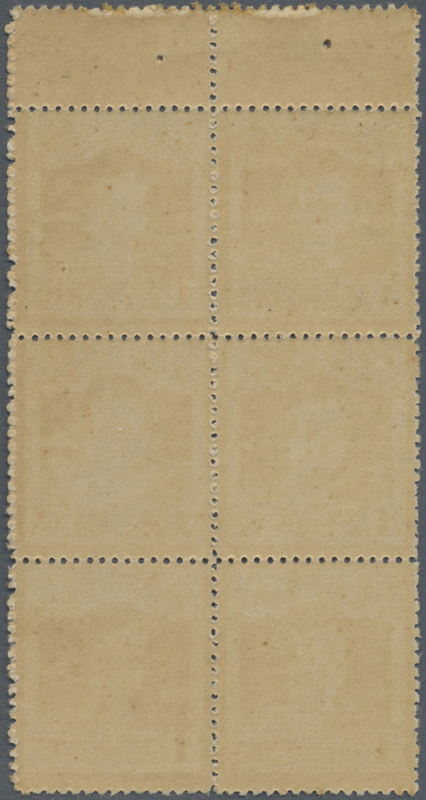 6046 ungebraucht (hinged) * 193U (3) 1926, 2nd Peking printing, junk 4 C. olive, a horizontal strip-3, vertically imperforated in-between, unused mounted mint. 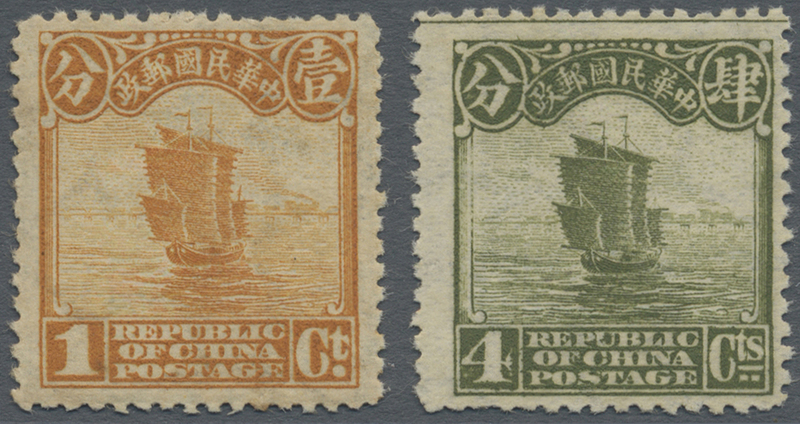 6047 gestempelt (marked) Paar (few) 193U (2) 1926, Peking 2nd printing junk 4 C. olive, a horizontal left margin pair vertically imperforated, canc. 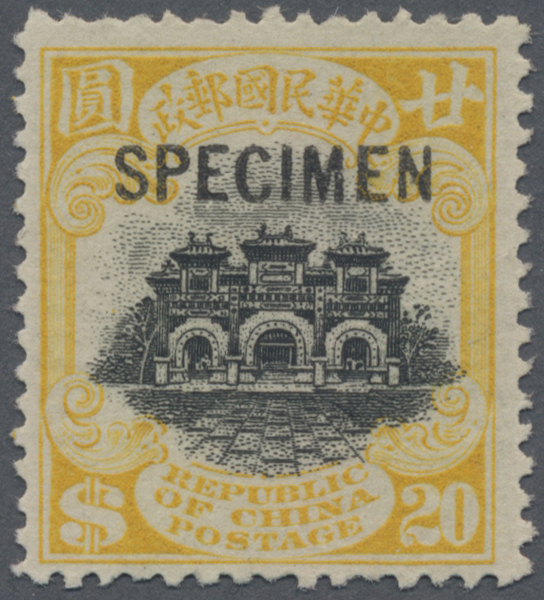 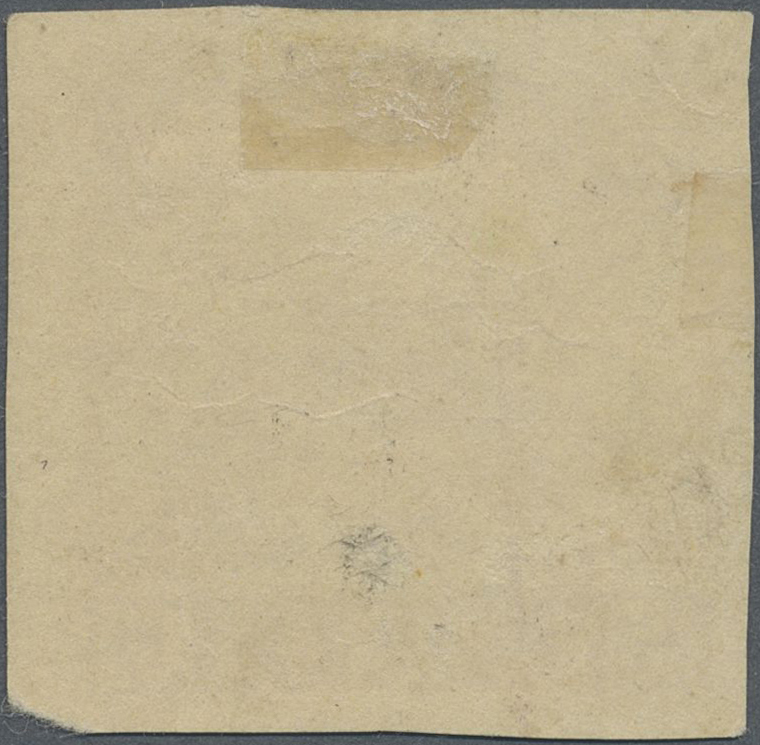 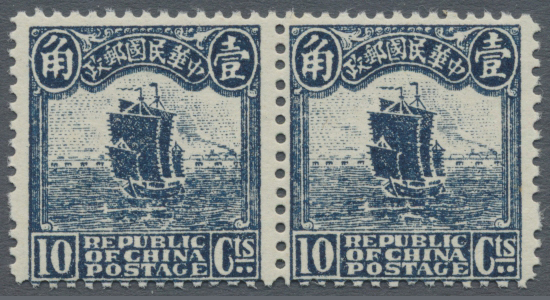 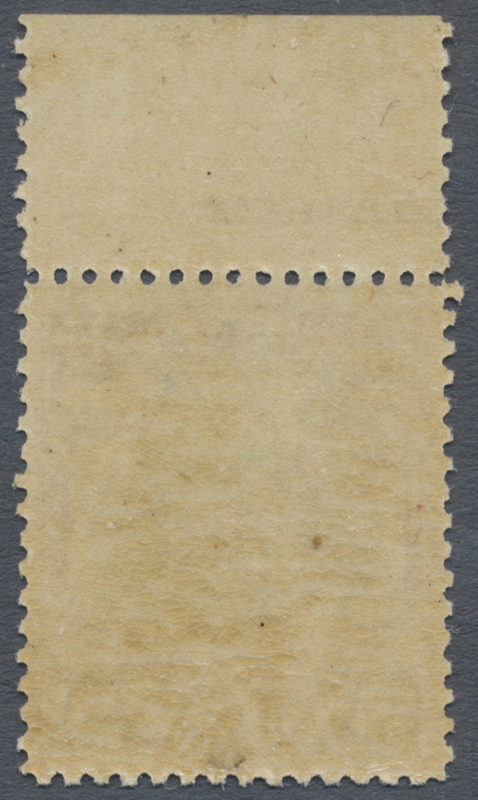 "PEIPING 27.10.23", crease ironed out, considerably scarcer than mint (Chan 255c). 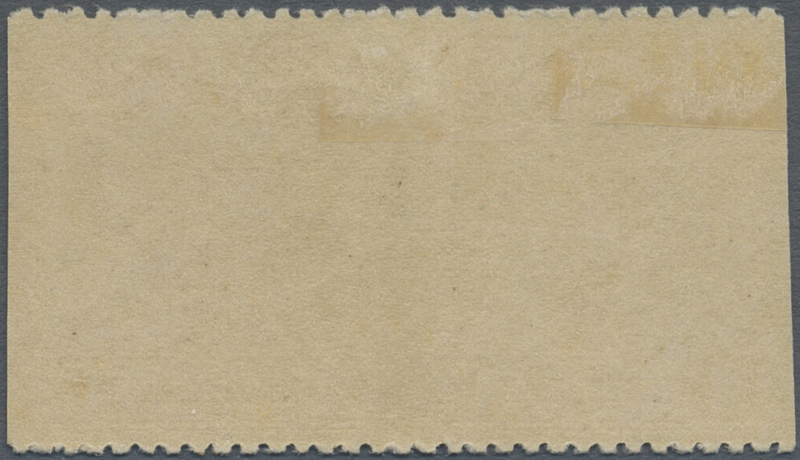 6049 postfrisch (never hinged) ** 198 var. 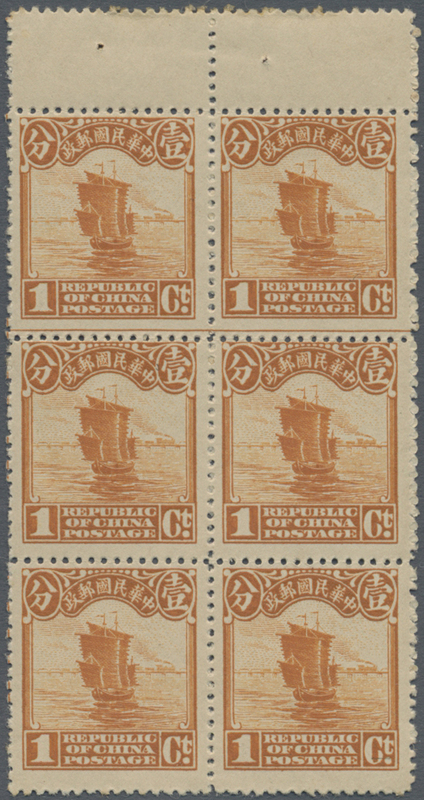 1923, 2nd Peking printing, junk 10 C., examples of panes specially printed for booklet, a bottom margin pane of 6, mint never hinged MNH. 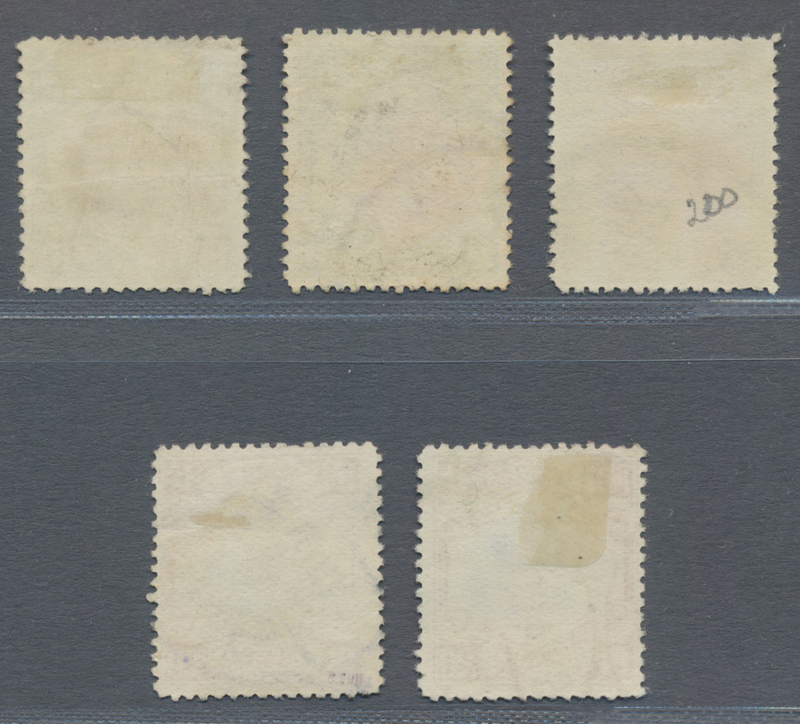 6050 postfrisch (never hinged) ** ungebraucht (hinged) * 198 var. 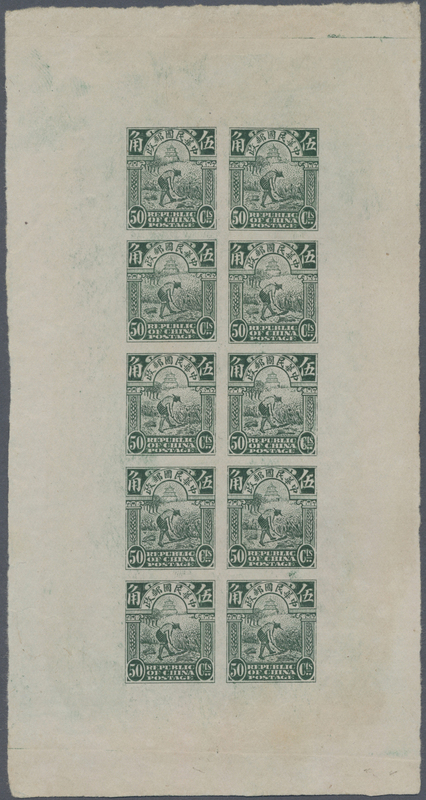 (6) 1923, 2nd Peking printing, 10 C. prepared but not used in booklet, pane of 8 with top imprint margin "Chinese Bureau of Engraving and Printing" plate number 11, pos. 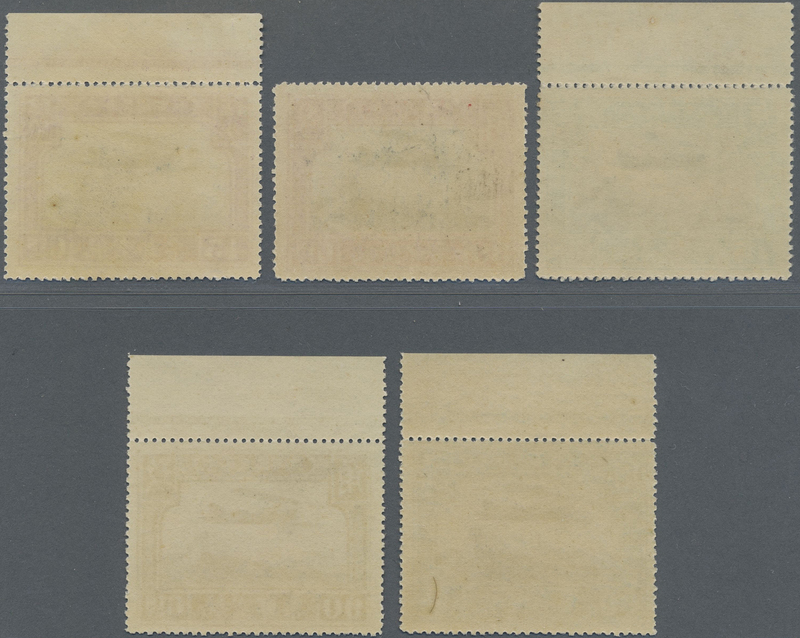 4 unused mounted mint, otherwise MNH, at right part perforation lines torn and backed, as is, a rarity. 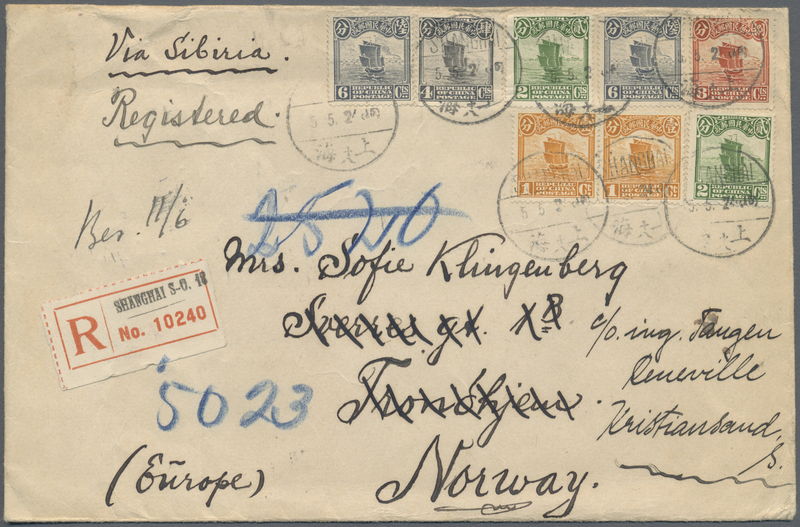 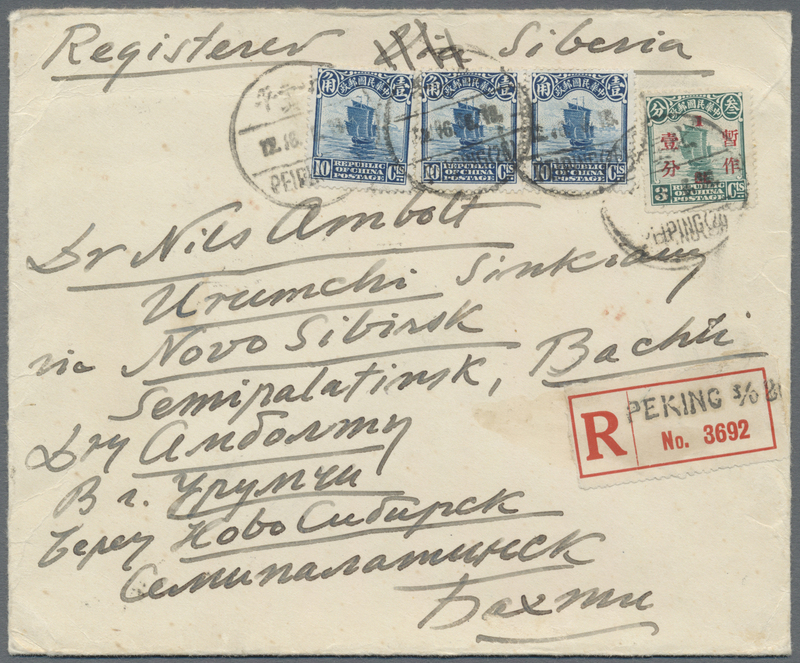 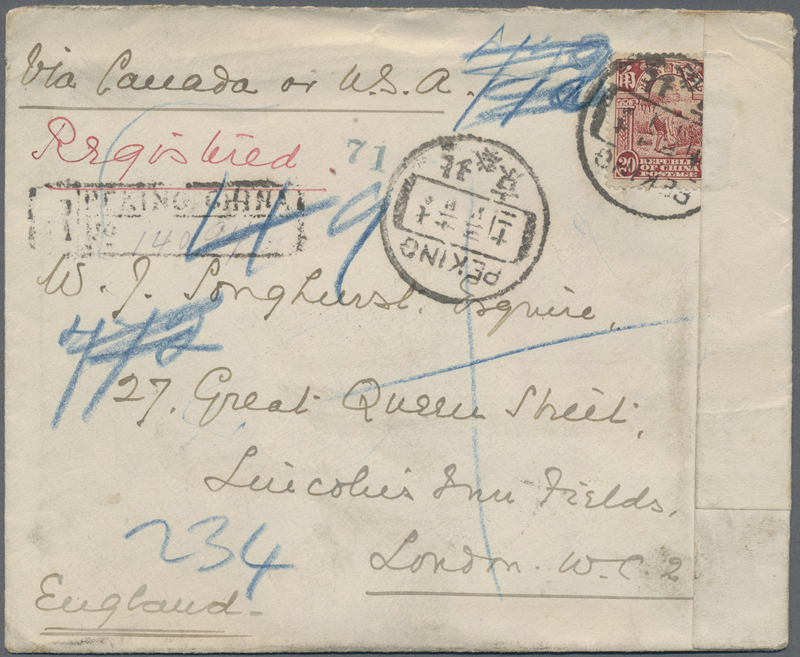 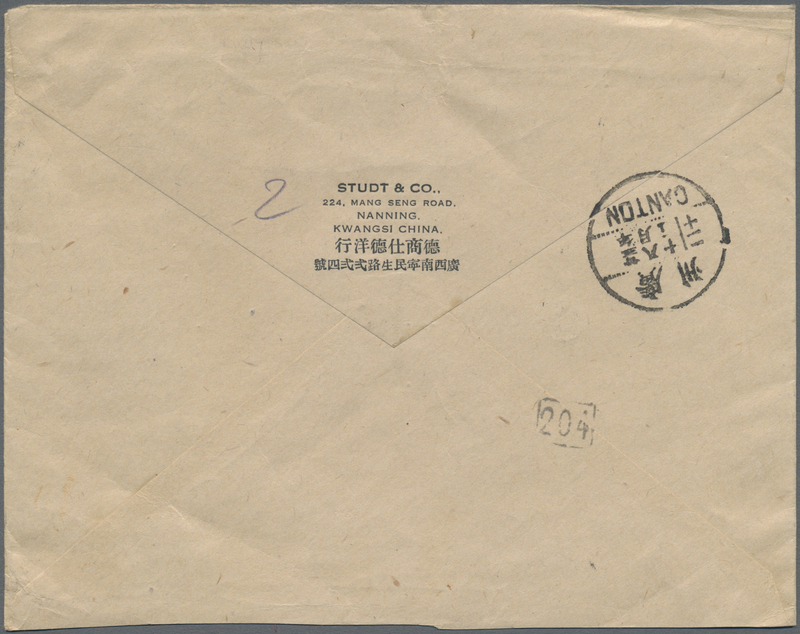 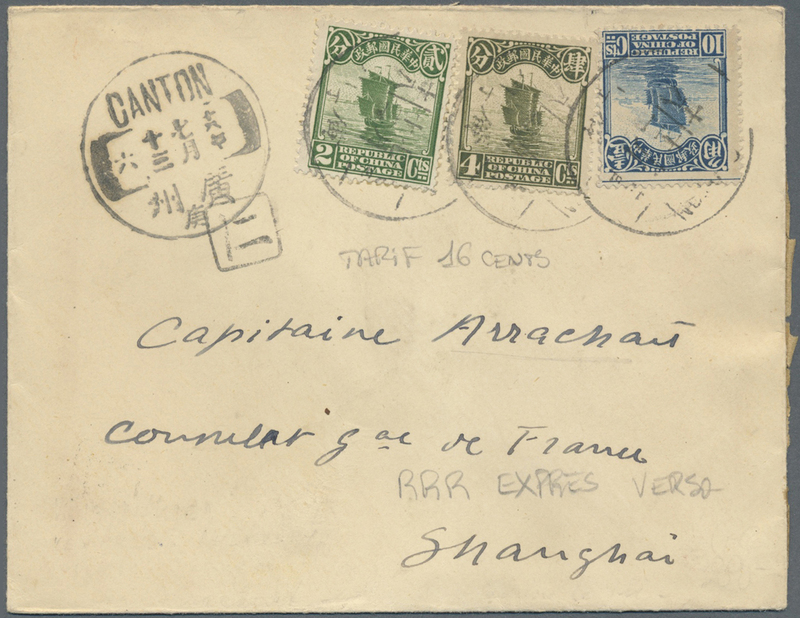 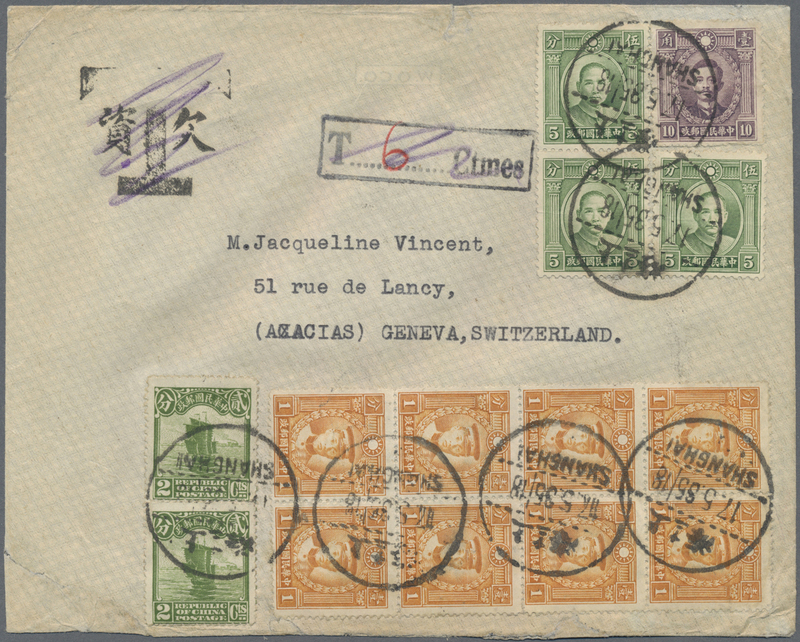 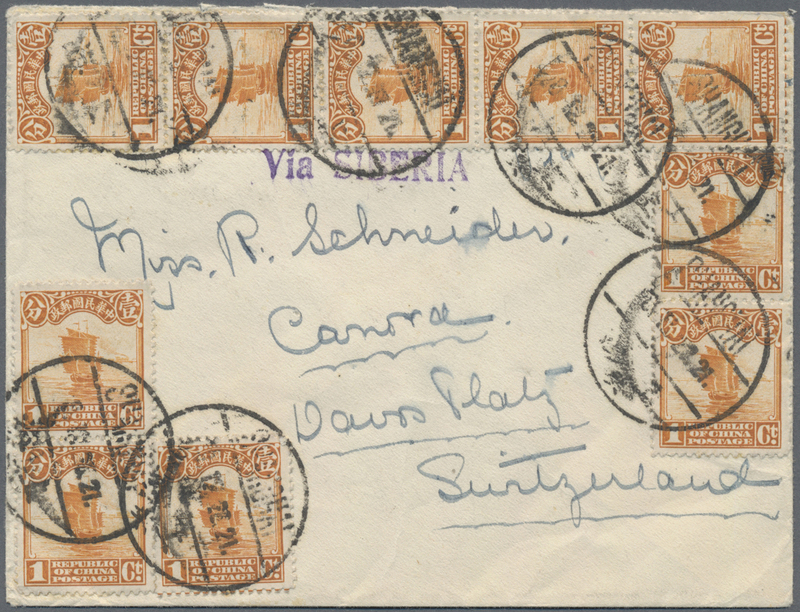 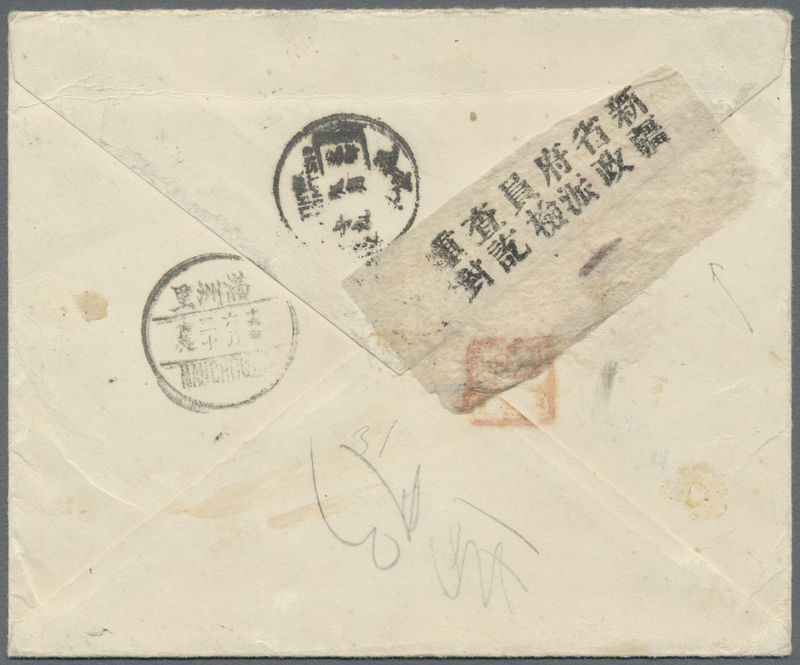 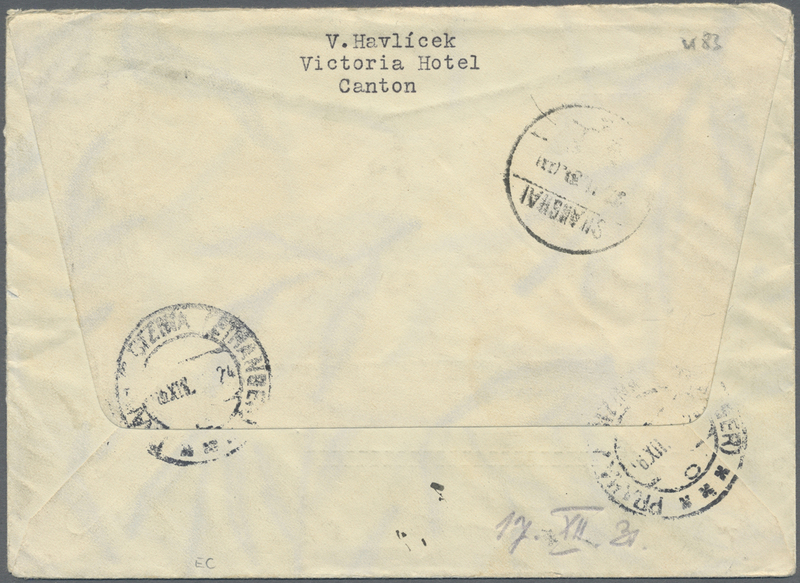 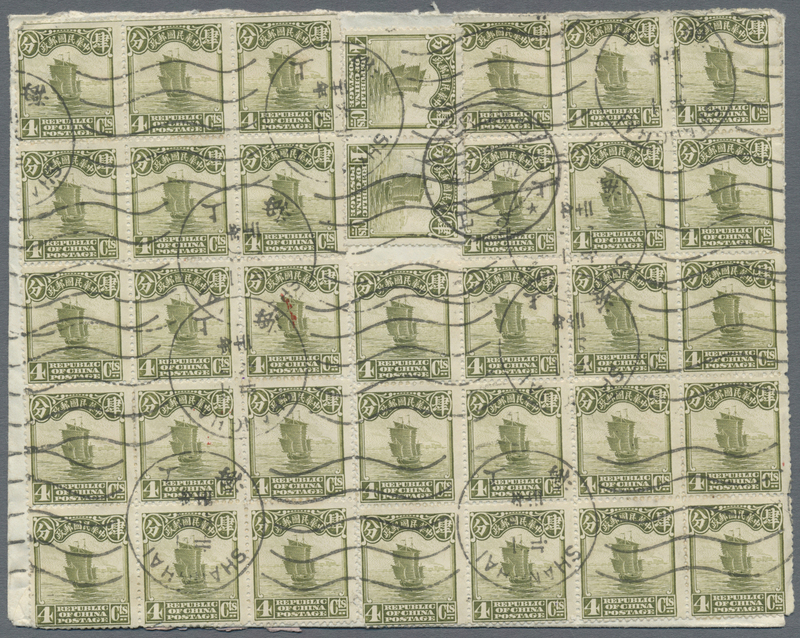 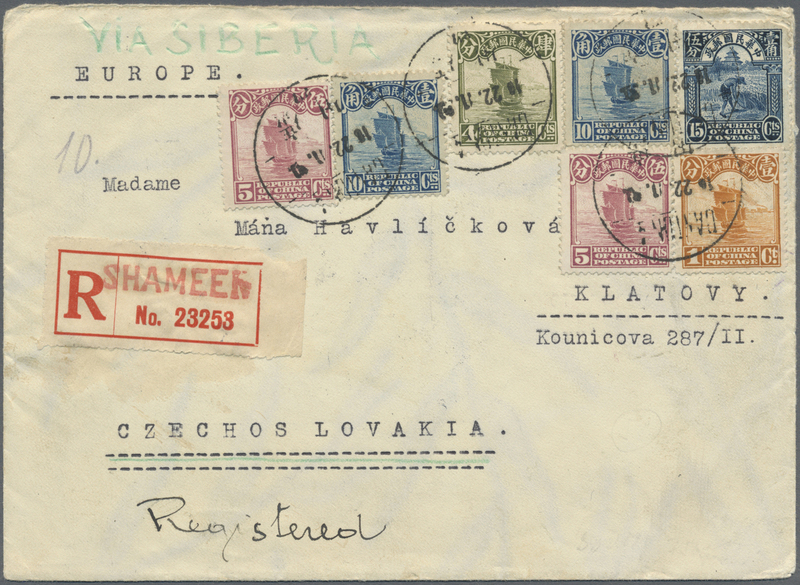 6052 Brief (cover) 198 (3), 288 1923, 10 C. (3) with 1930, 1 C./3 C. tied "PEIPING" (label still says Peking) via Siberia, Manchouli, Novo-Sibirsk, Semipalatinsk and Urumchi to Bakhti/Sinkiang, very unusual inland mail via Russia. 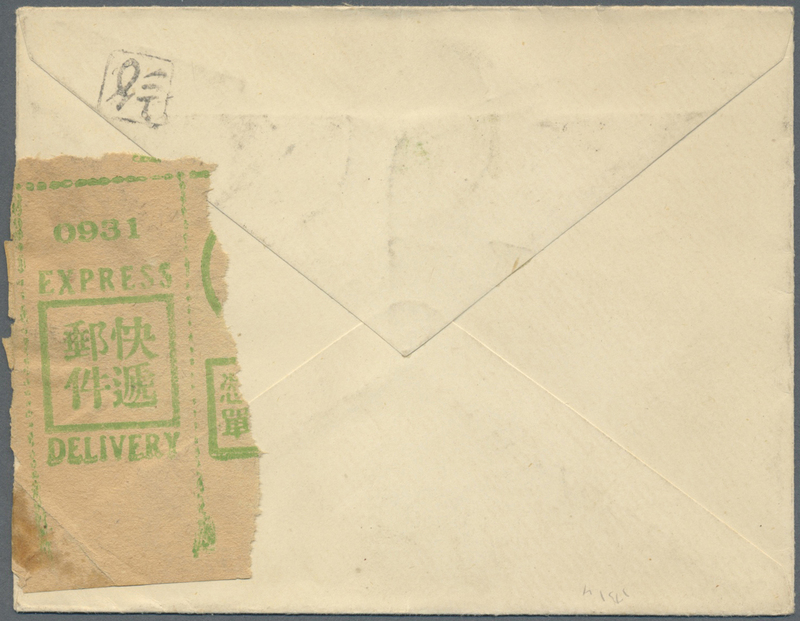 Censor tape of Sinkiang govt. 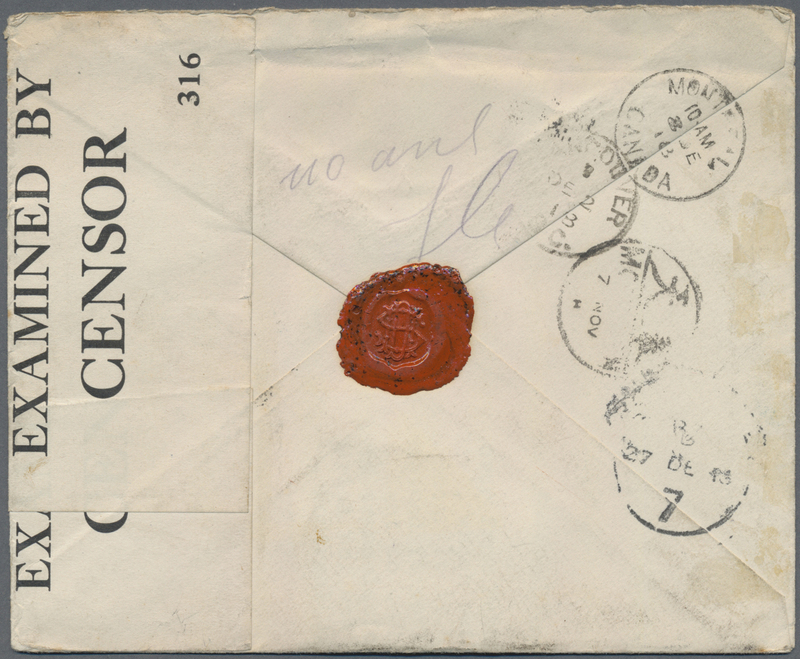 special censorship commission. 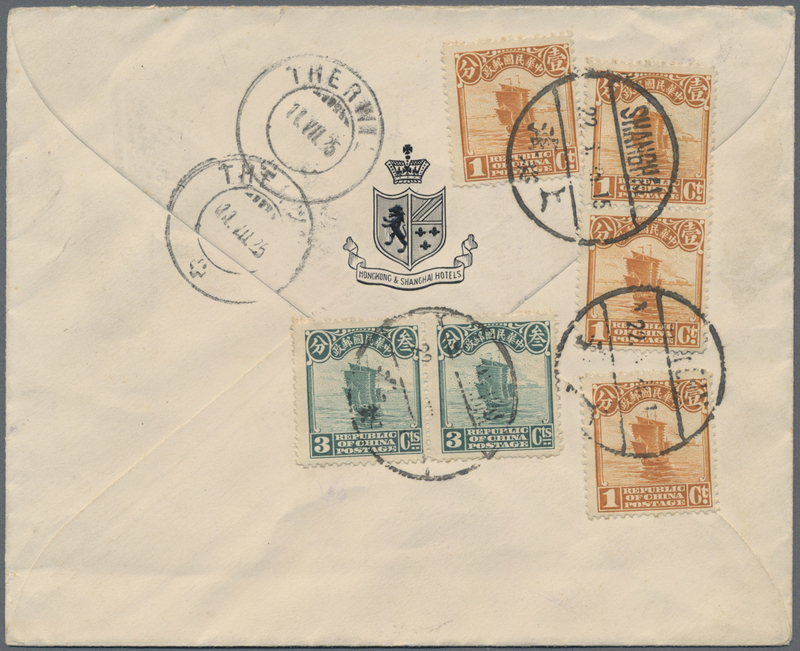 6056 Brief (cover) 206 (2) etc. 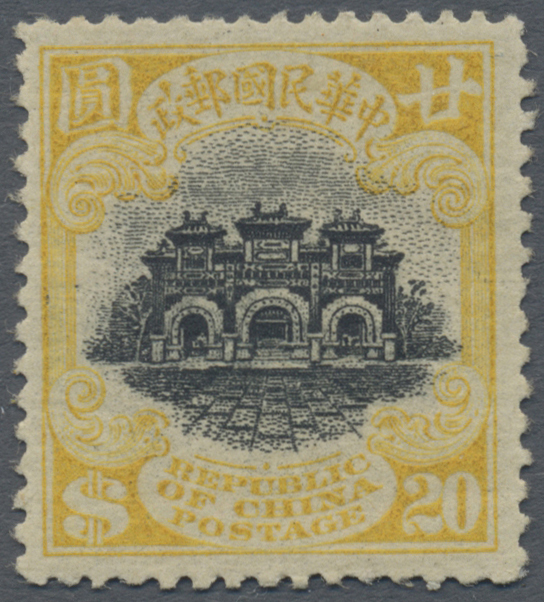 1931, $2 (2) etc. 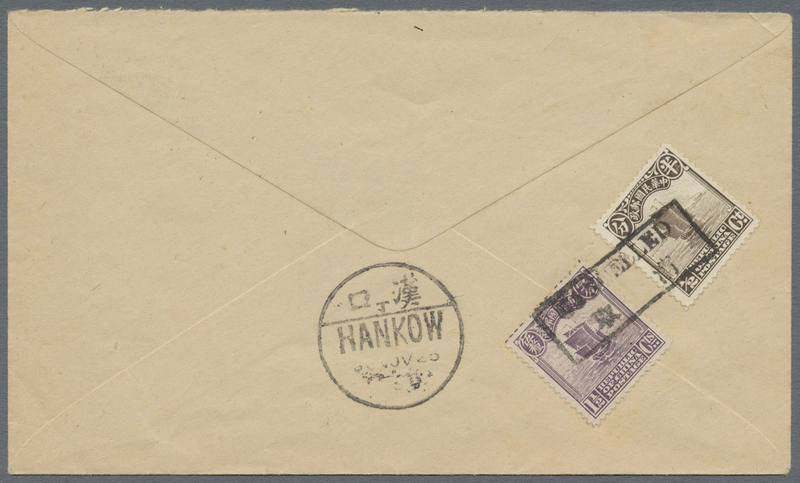 $4.54 franking tied special pictorial "Nanking / Inauguration of International Airmail / 20.5.31" to reverse of registered airmail cover (Eurasia official commemorative envelope) to Wernigerode/Germany, transit special "Manchouli ... 20.6.1", Berlin red airmail confirmation + dater June 11 L2 (airport office) and next day arrival, vertical bend not affecting stamps.